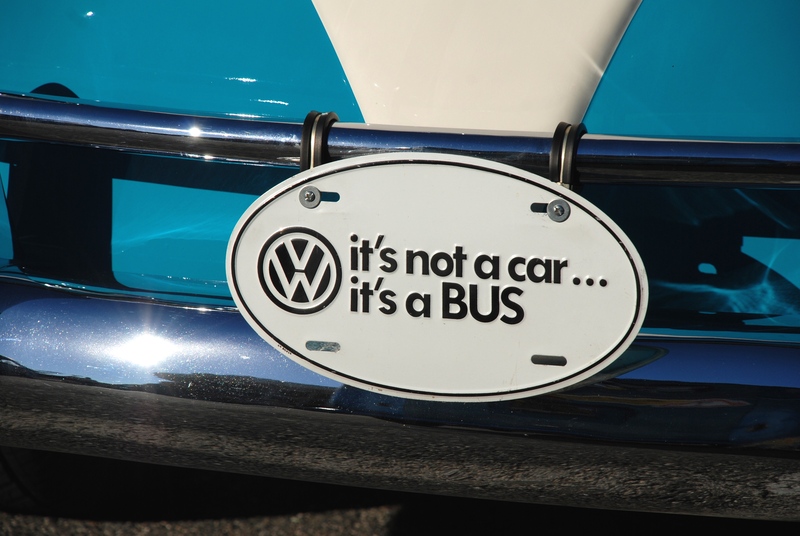 “It’s not a car… it’s a BUS – definitely a 1960s marketing slogan from Volkswagen, and given my surroundings Saturday morning February 14th, there was no mistaking that I was entering into a sea of Volkswagen transporters (buses). 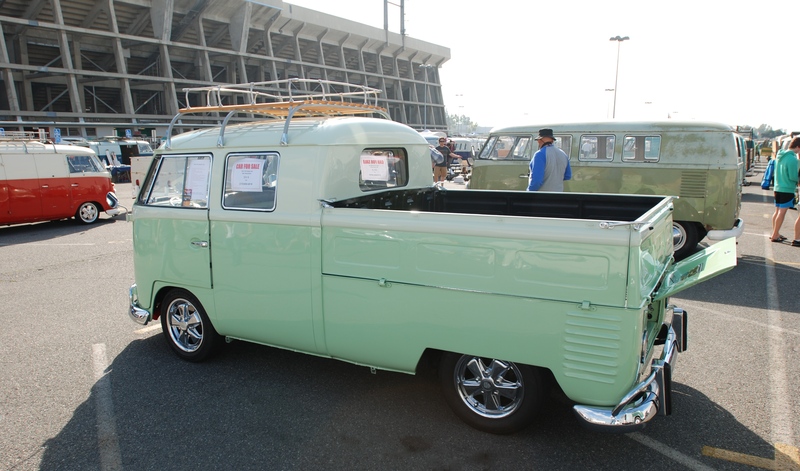 Held each year at the Long Beach Veterans Memorial Stadium in Long Beach, California, it’s always a morning of discovery, and an opportunity to hear the back stories behind the vehicles on display. The irony of this years O.C.T.O. Winter Meet was that given the clear blue skies and summer like temperatures being experienced in February, this could have easily passed as a summer meet. 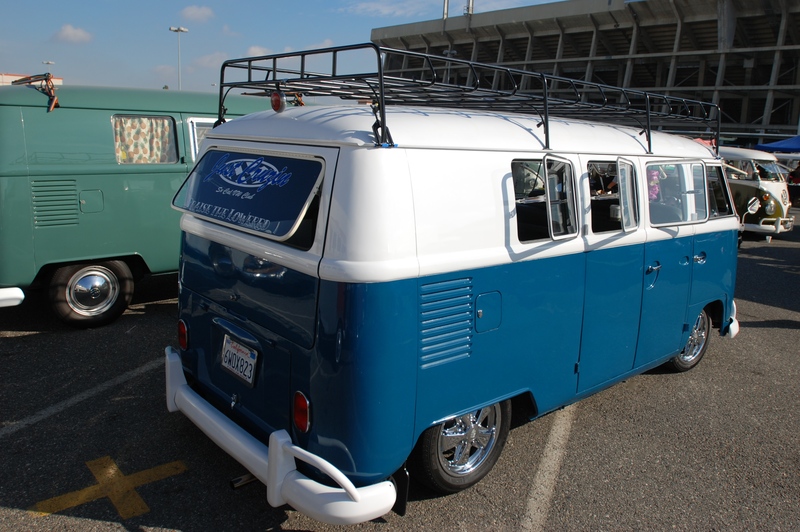 and her husband’s blue 21 window parked to the drivers right (below). It has been interesting to watch the progress made from year to year on this dual restoration effort. 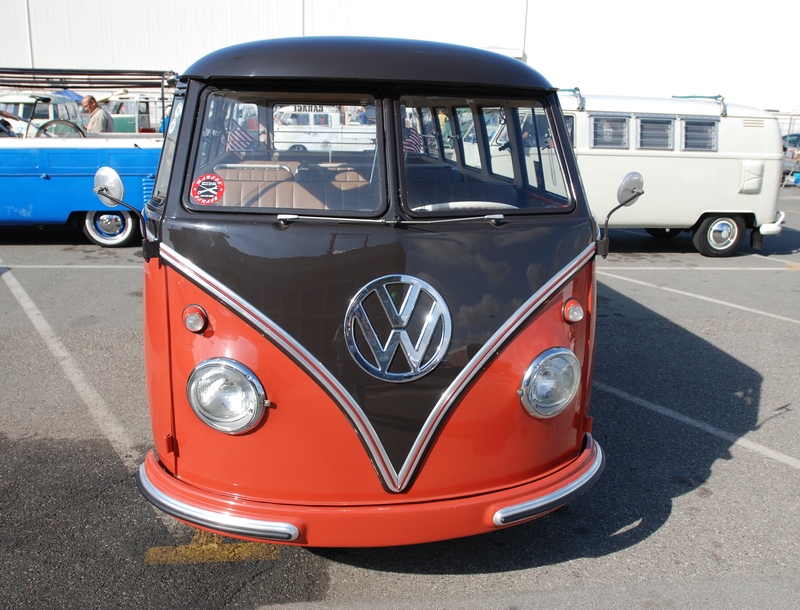 At the opposite end of the restoration spectrum was this early 1960s type 2 bus. Unfortunately, this bus was a painful reminder of the effects of time and exposure to the elements, as seen below. 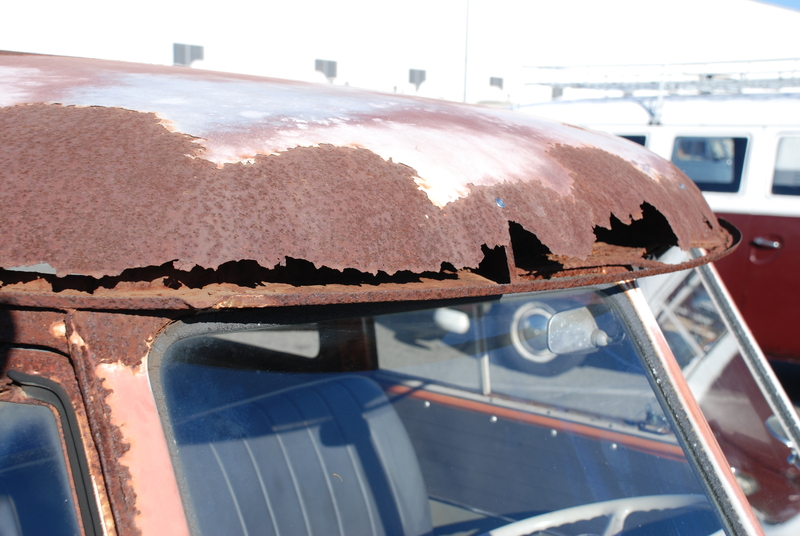 Given the extent of the rust, it was amazing that the roof and its body parts were still connected. However, upon closer inspection, it became obvious that the roof had assistance in the form of strategically placed sheet metal screws. 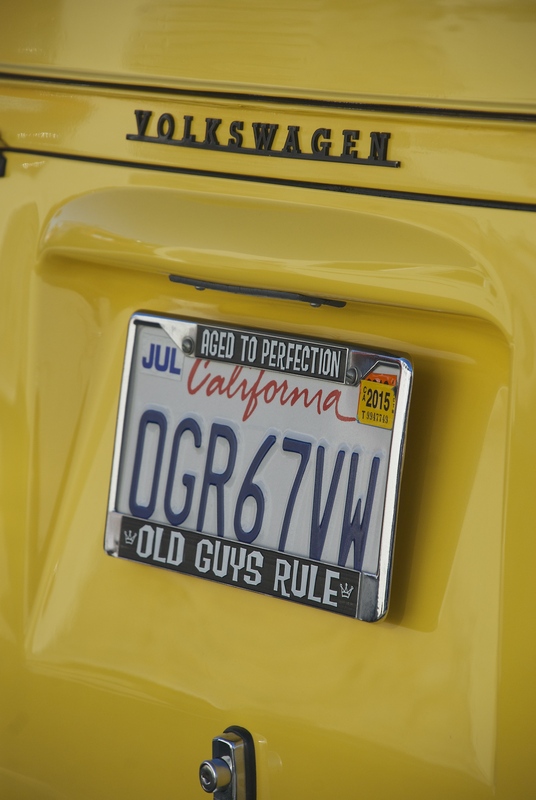 and wearing a rather interesting license plate. 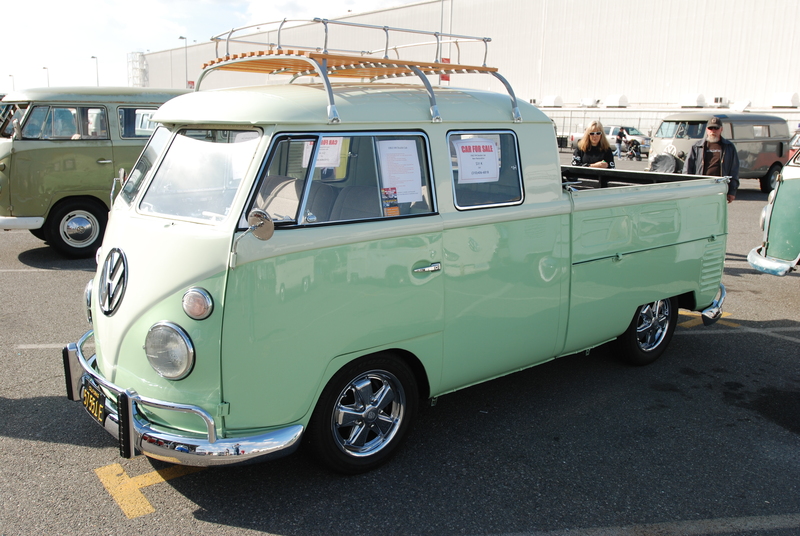 Representing one of the model variations found within the type 2 transporter category, was this 1967 two-tone, dual-cab seen below. 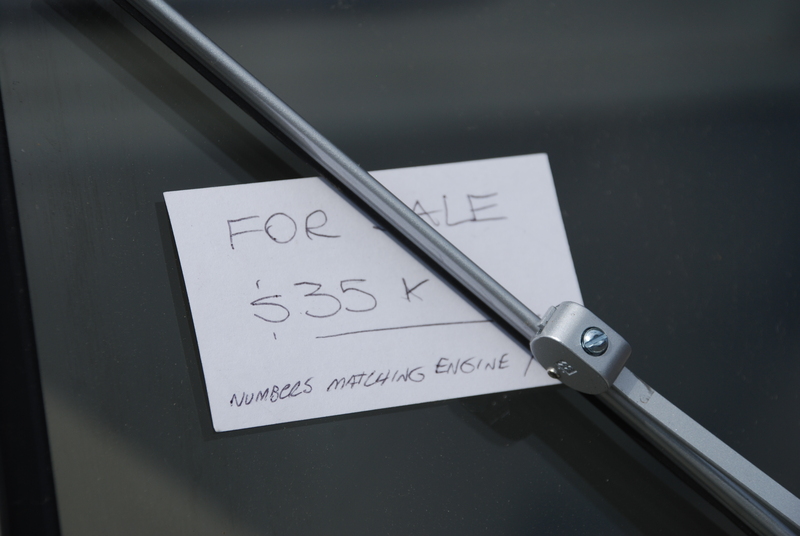 If one looks closely, there are frequently clues to be found which aid in revealing a vehicles true identity. 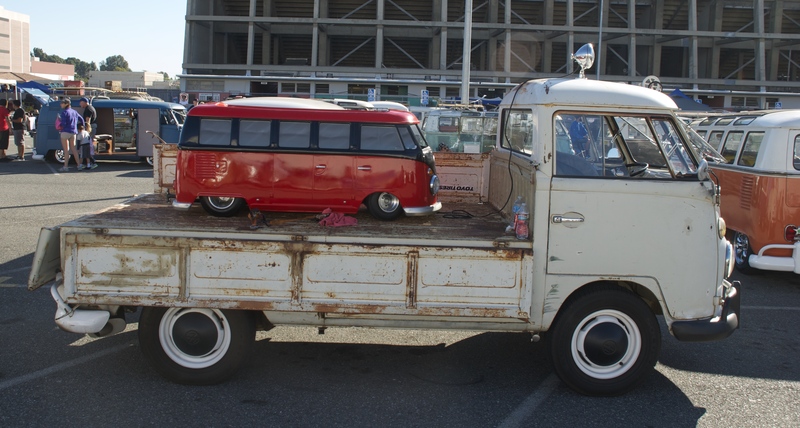 (Below), one of several single-cabs present, but the sole participant carrying special cargo. 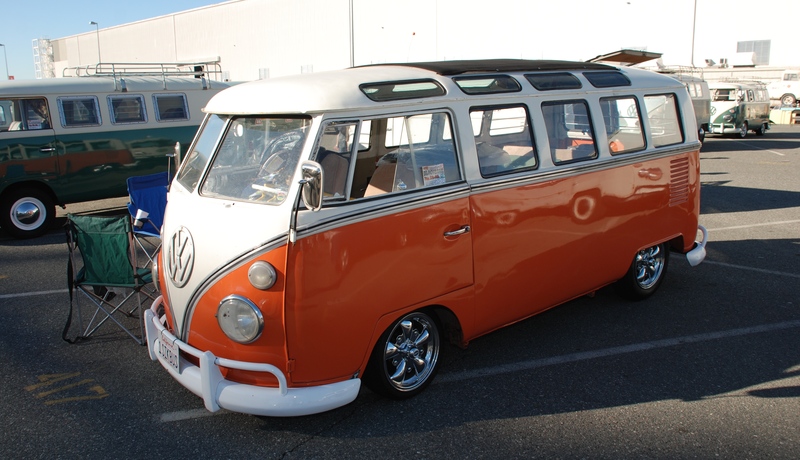 and several rows over, a second 21 window safari, dressed in orange over white. 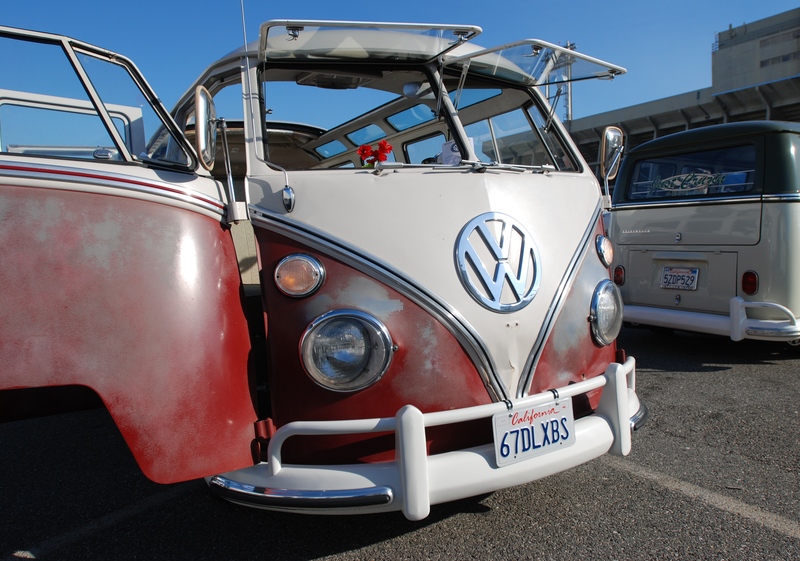 One never knows what extremes an owner will go to, in order to personalize his/her bus as witnessed below. 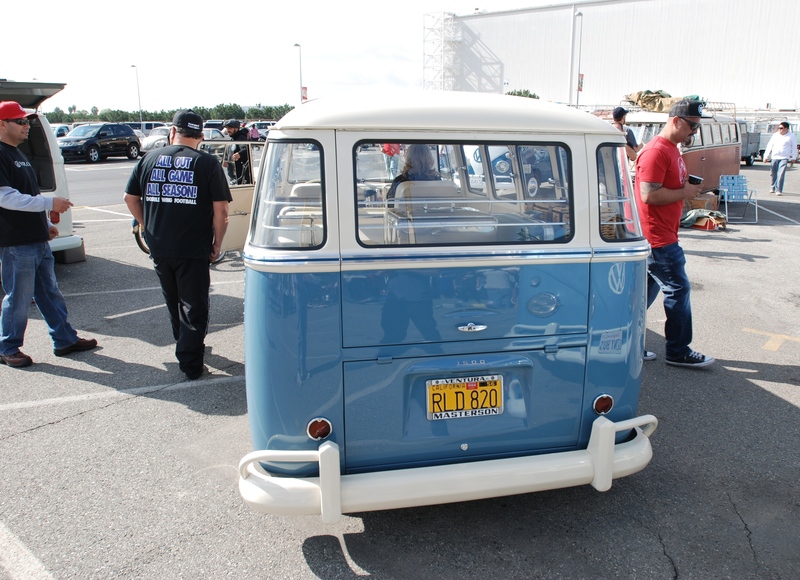 (Below), one of my favorite type 2s in this years show. 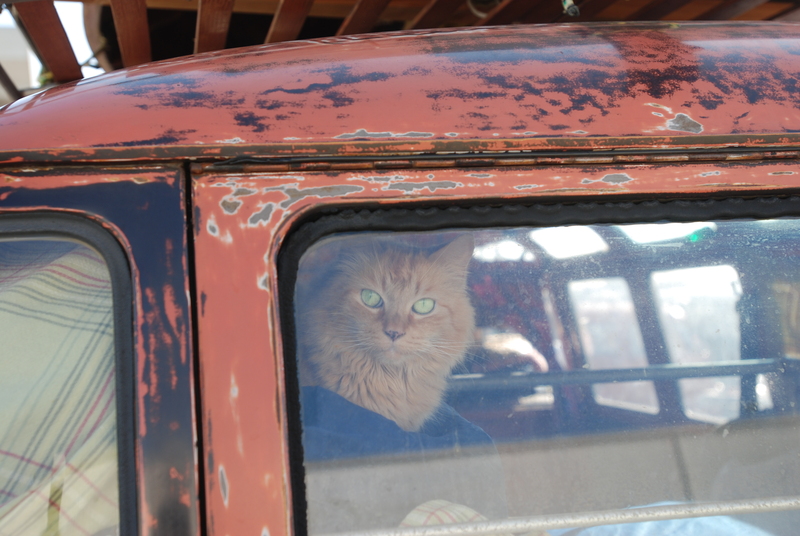 While photographing this bus, I was approached by the owner and we struck up a conversation. 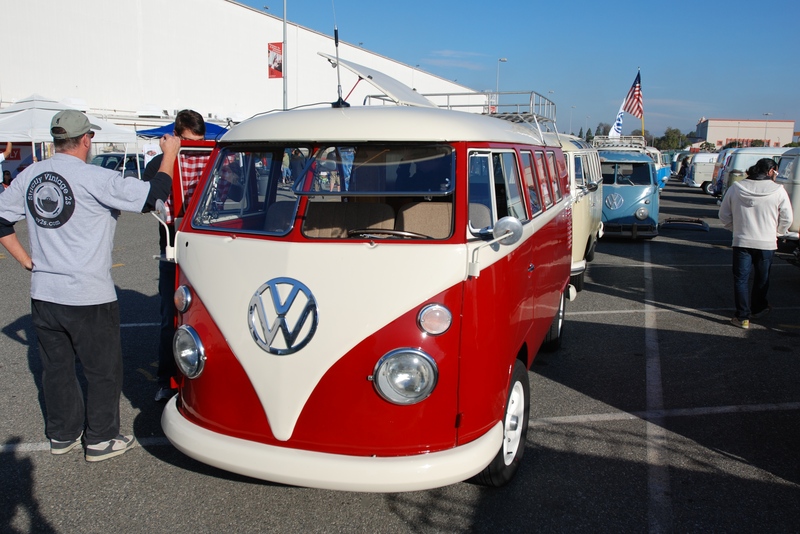 During our discussion, I learned that this 1961 bus had originally been owned by his grandfather, who purchased it back in 1963, and then used it as his daily driver. 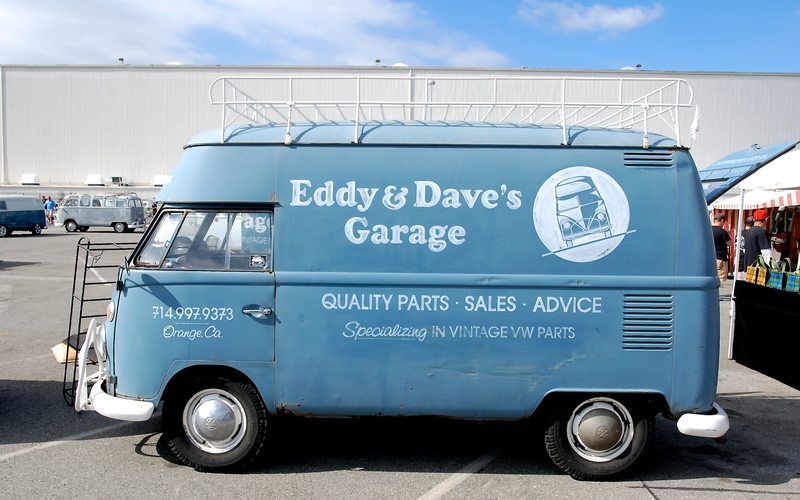 Many years later, and with the passing of his grandfather, he inherited the bus, and then proceeded to store it away in his garage. It ended up sitting there untouched, awaiting restoration for 18 years. 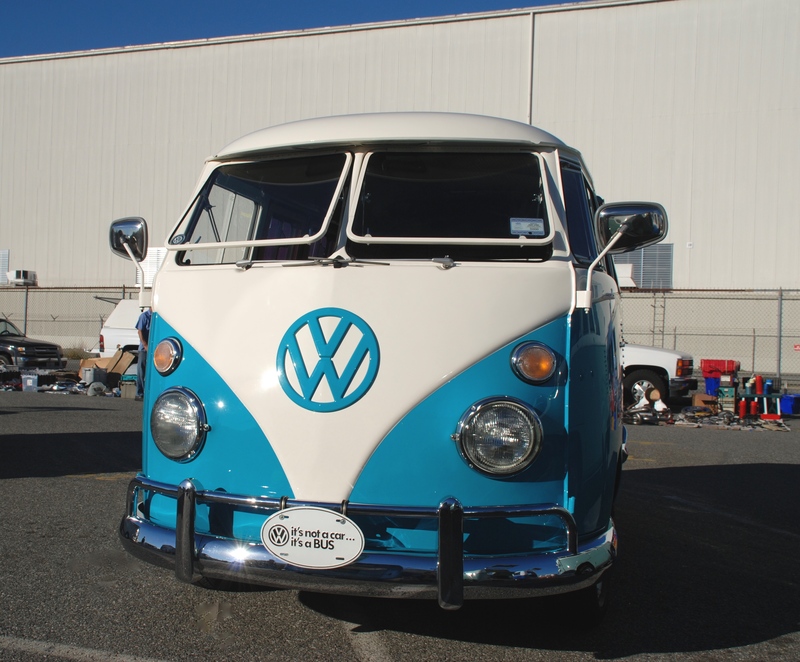 With his kids graduated from college, he decided to finally tackle the restoration of the bus, with the majority of the restoration work having been completed by the owner himself. 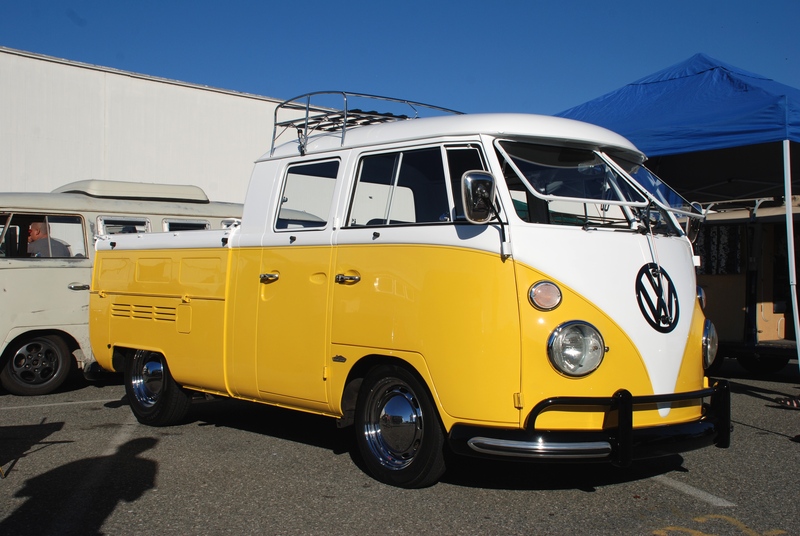 The owner continued his story, sharing the memories that he and his brother had, of vacationing with their grandfather, and how hot they were sitting in the back of the bus during the summer. 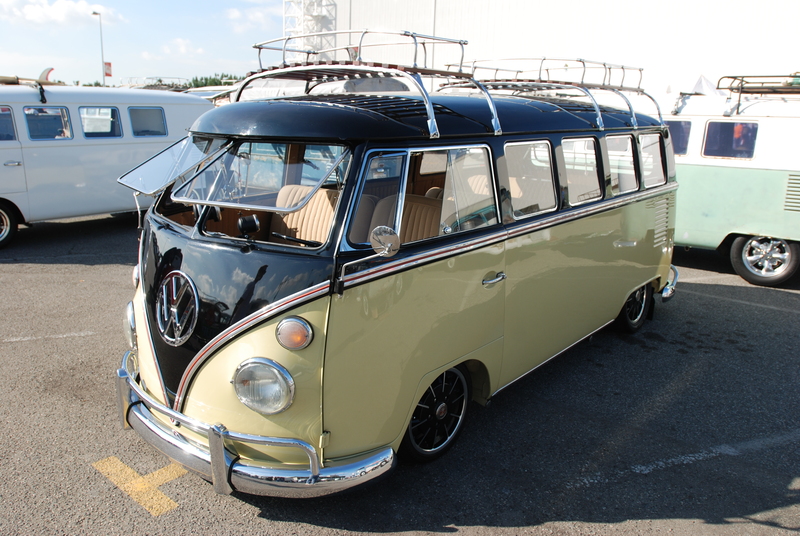 Because of the heat factor, the owner decided to added a set of safari front windows. 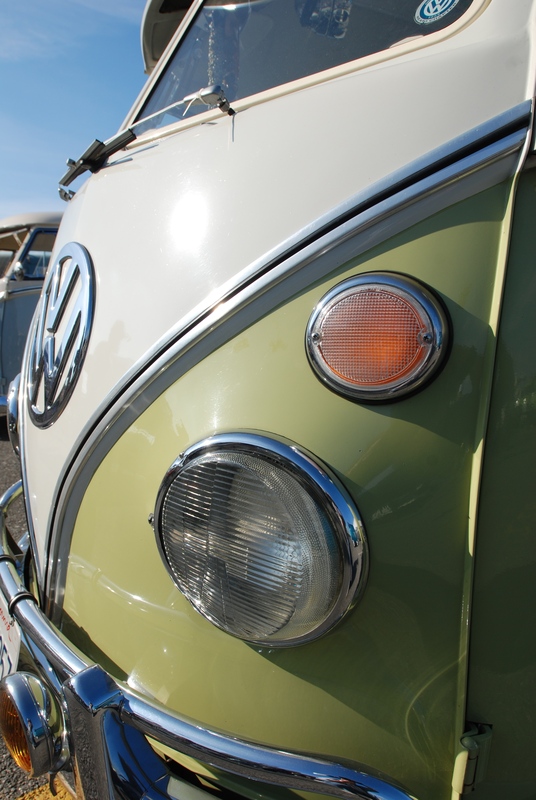 He also shared stories of his grandfather driving the bus into mexico to his ranch, traversing dirt roads and creeks along the way, with evidence of these adventures uncovered during the buses restoration. 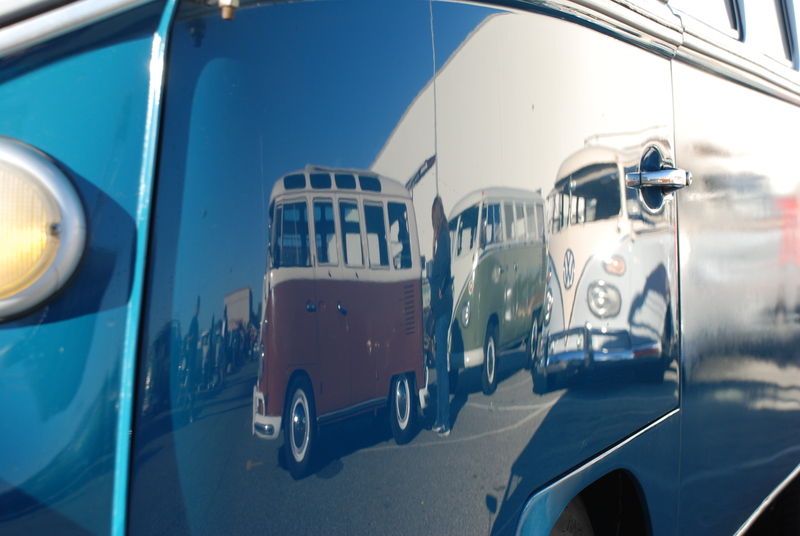 Looking at the bus on that Saturday morning, it was hard to believe that it had not lived a pampered life. 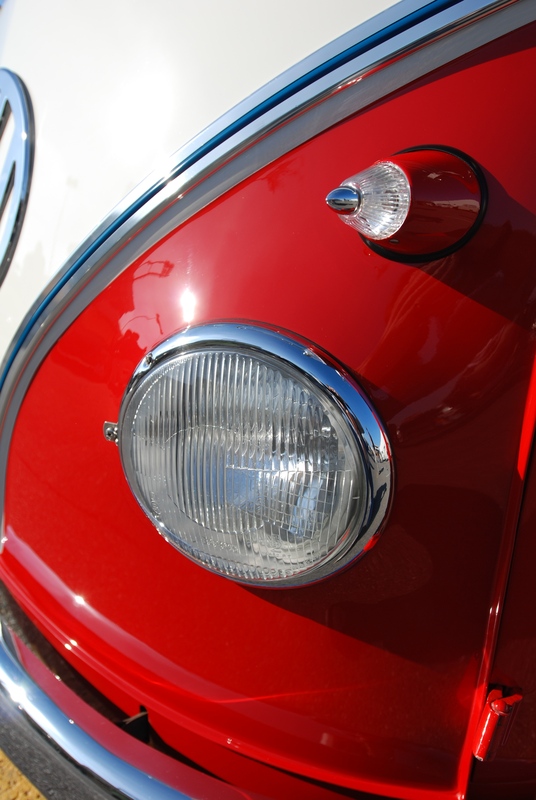 Below, the bullet shaped front turn signal, identifying this type 2 bus as a 1961 model. 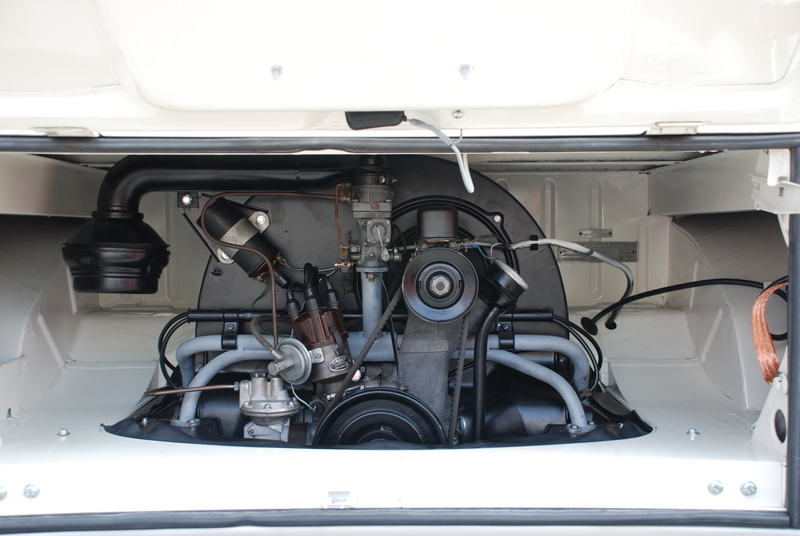 Far from the stock motor that the bus was delivered with back in 1961. 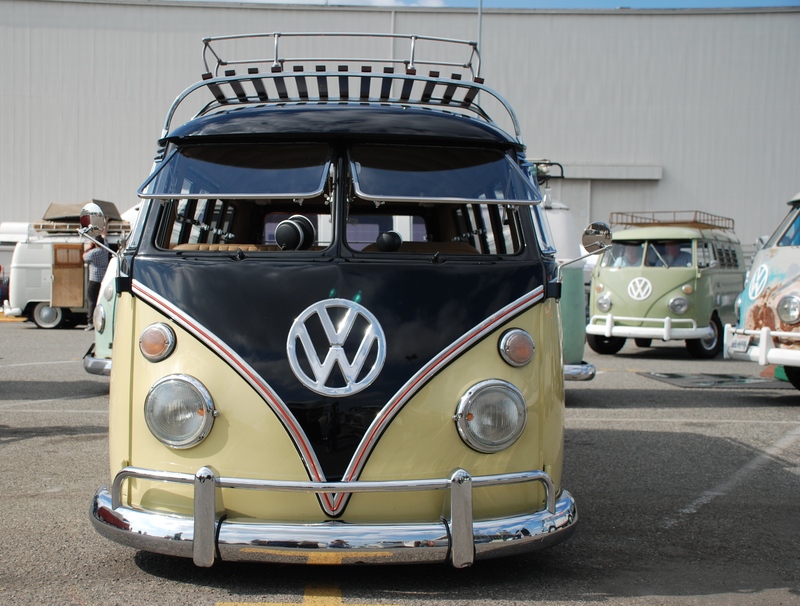 Once the restoration was complete, the owner unveiled the bus at their yearly family reunion, to the surprise of many relatives. 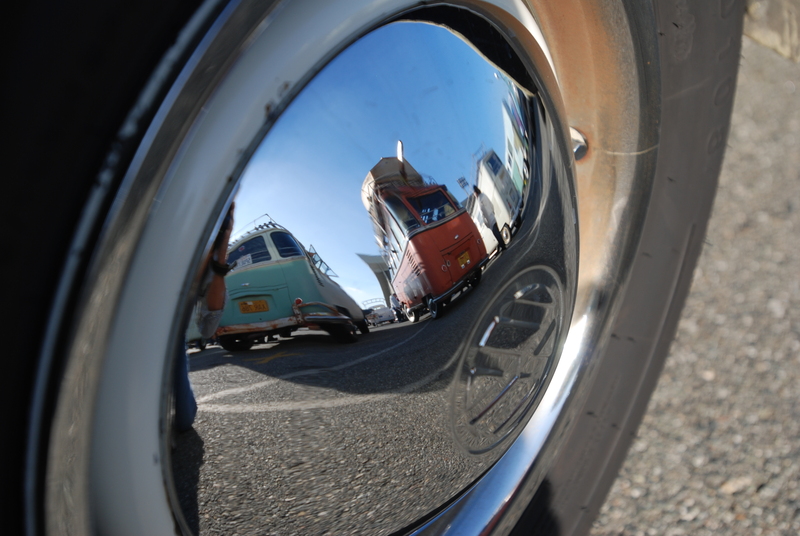 The bus became the inspiration for a project his wife began; collecting and recording in written from, the stories from their many relatives with memories of grandpa’s bus. 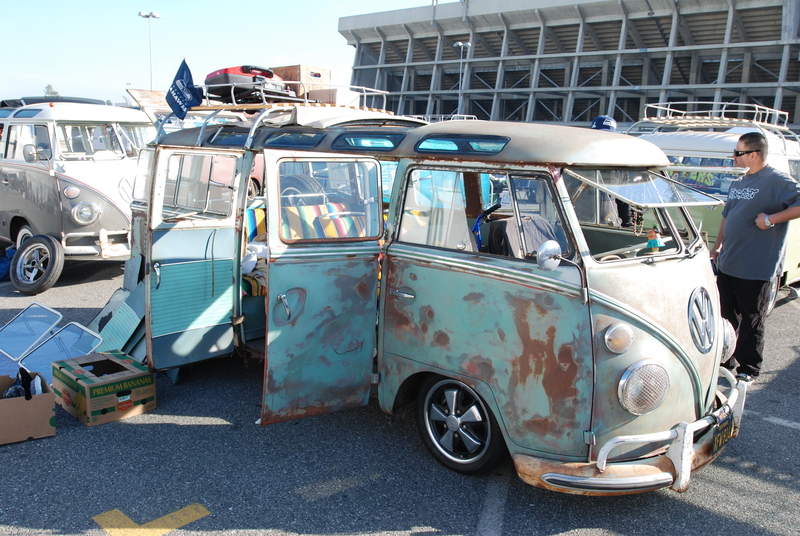 Parked on the perimeter of the display area were several unique Volkswagen cars… not Buses, as seen below. 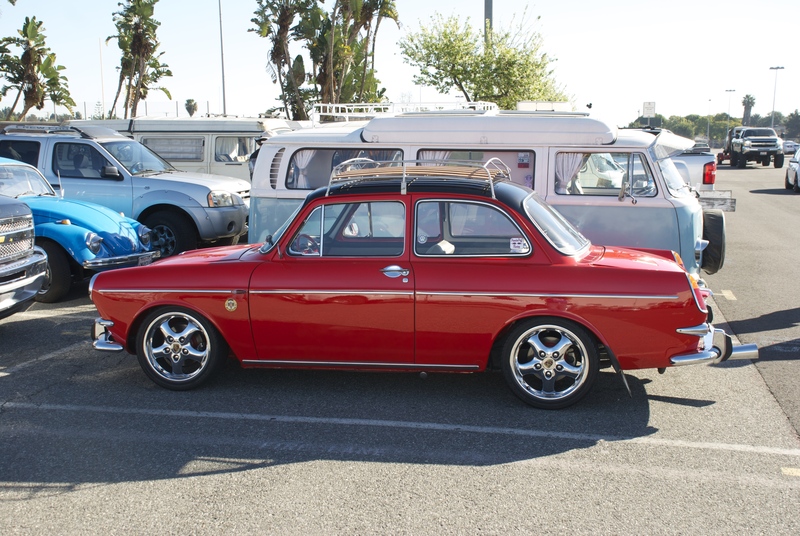 and parked on the opposite side of the parking lot; a beautifully restored VW Notchback. With this kind of weather and impressive turnout for the O.C.T.O. 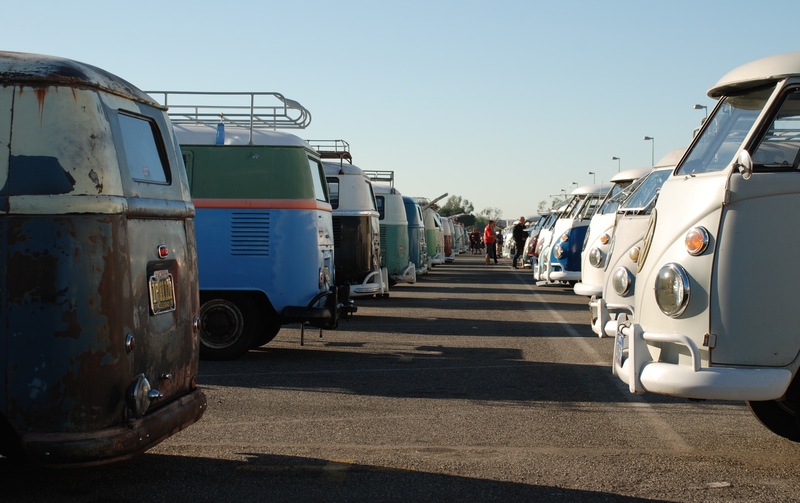 Winter Meet, one can only imagine what the O.C.T.O. Summer show will deliver. 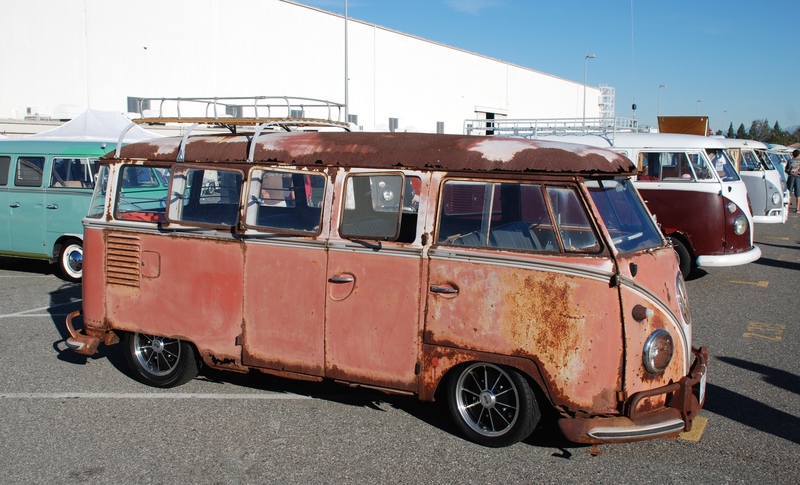 “Winter rain shrinks Type 2 Transporter, or how I spent my Saturday morning at the 2014 OCTO Winter Meet”. Thankfully the rains that had arrived late in the week in Southern California had left as Saturday, February 8th approached. 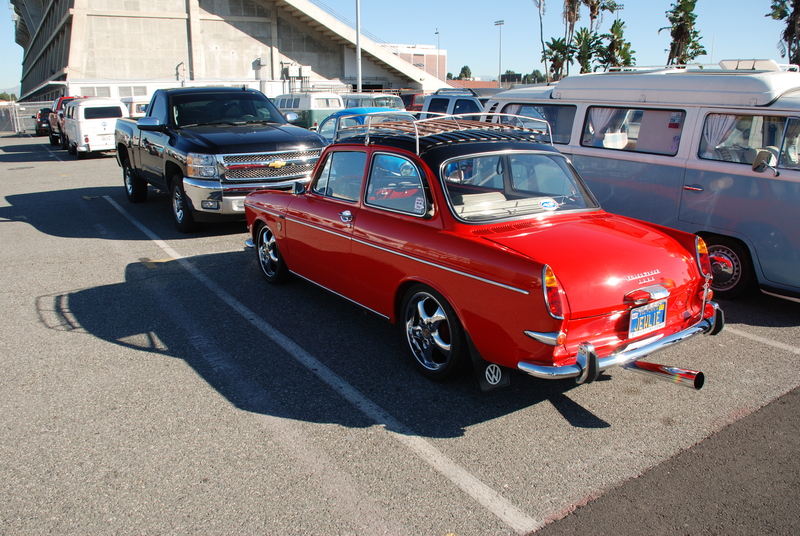 The reason for my concern was that on Saturday, the “2014 OCTO Winter Meet” would once again be held at the Long Beach Veterans Memorial Stadium, and I had missed their last event. Fortunately for all involved, Saturday morning dawned crisp and clear, albeit a bit cooler than we Southern Californians are used to. 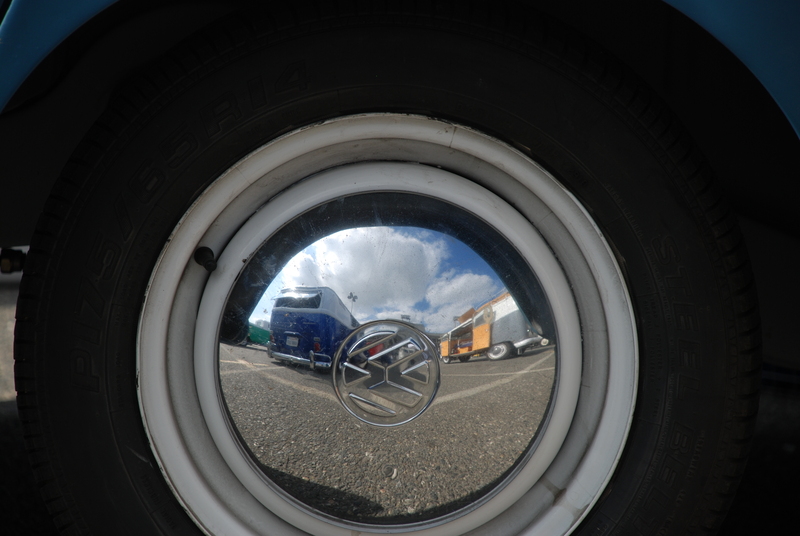 It’s hard to imagine a better view for anyone interested in VW Type 2 transporters, than the scene presented below, upon entry into this years Winter meet. 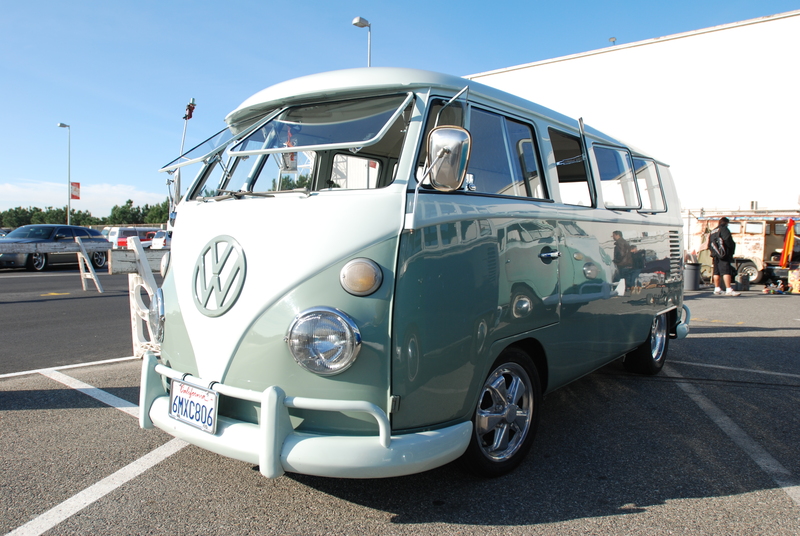 Anchoring the end of the first row was this beautiful green and white early 1960s Type 2 bus. 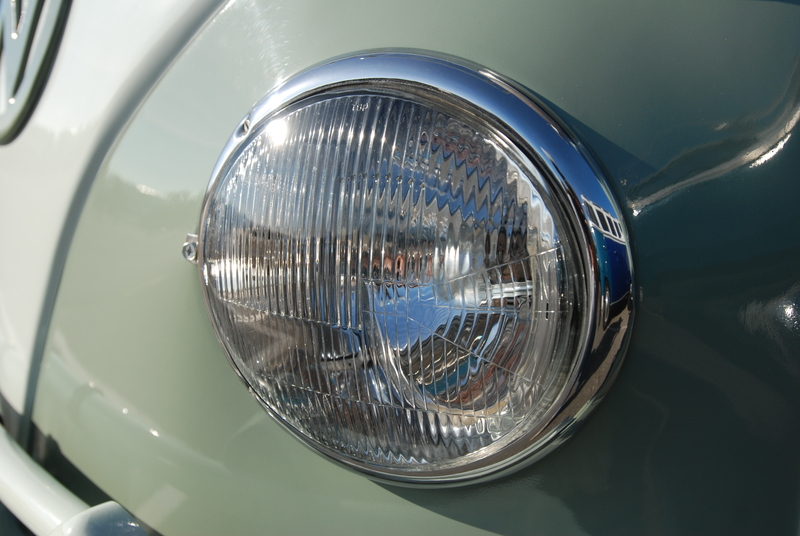 Having just completed the restoration on a set of Bosch European H4 headlights off of my Porsche 911, I have a new-found appreciation and interest in German headlights; trim rings, reflectors and flawless, crystal clear glass lenses from Bosch and Hella. The headlights on this bus (seen above and below), absolutely blew me away. (This image has become one of my favorite detail shots from this show). The next bus I came across turned out to be a long-term (but nearing completion), father and son project. 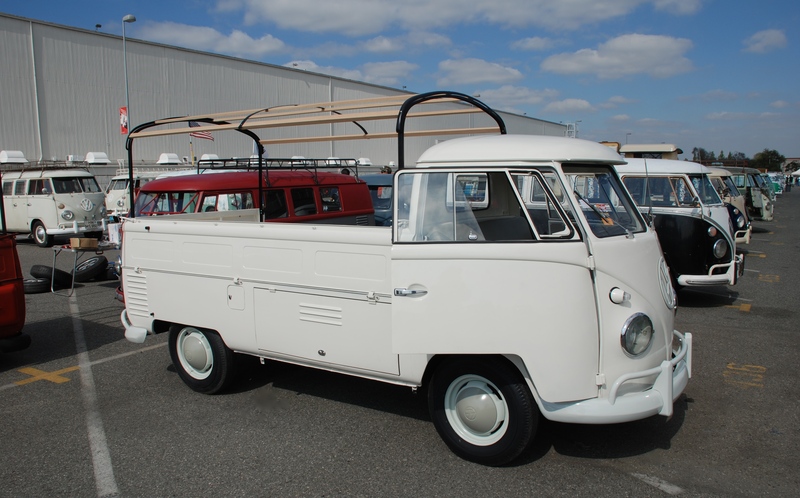 One very cool safari – windowed, 1963 Type 2 (as seen below), worked on together in the evenings. 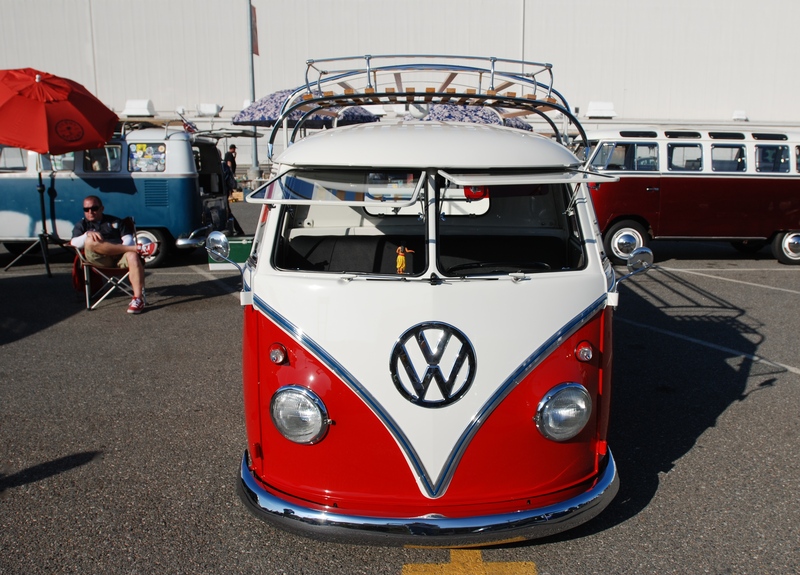 The teenage son told me that within a year, the bus will become his new ride, as soon as he gets his license. 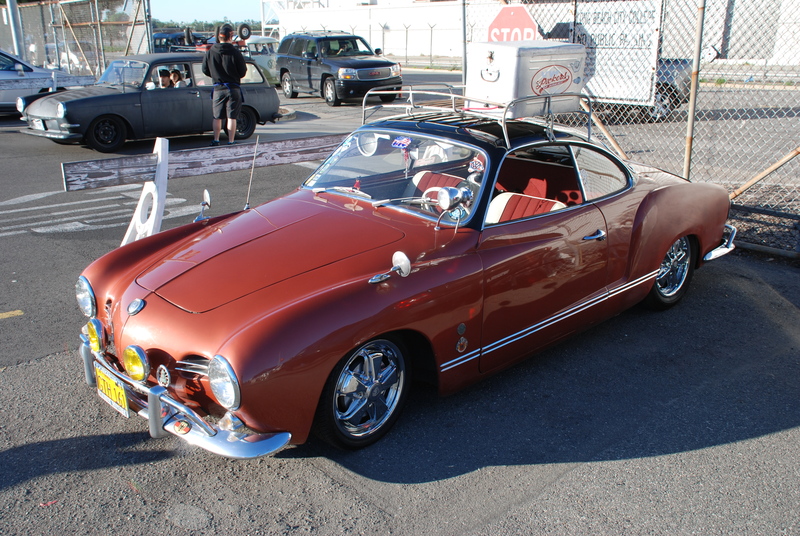 His dad then told me that upon the completion of this project, he will again be on a hunt for his next challenge, perhaps the restoration of a Porsche 356 or maybe even an early 911. 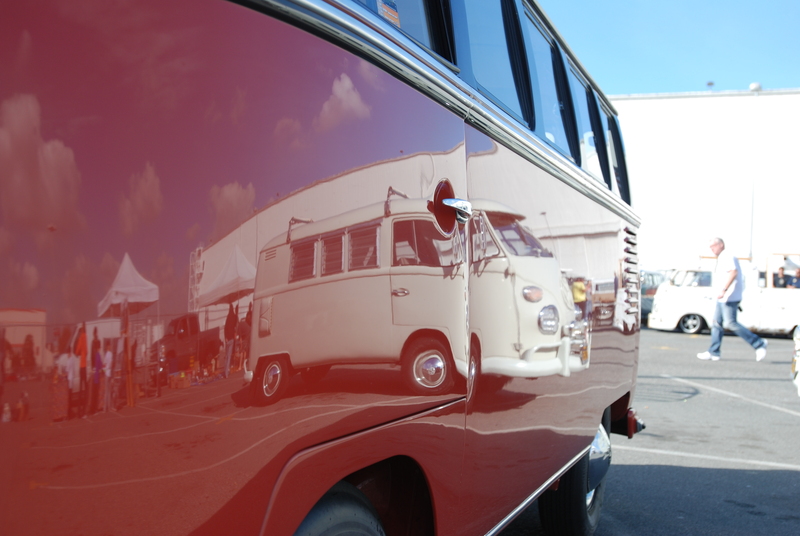 The brilliant, mirror finished paint, revealing its neighbor lurking behind. and a variation on a theme. 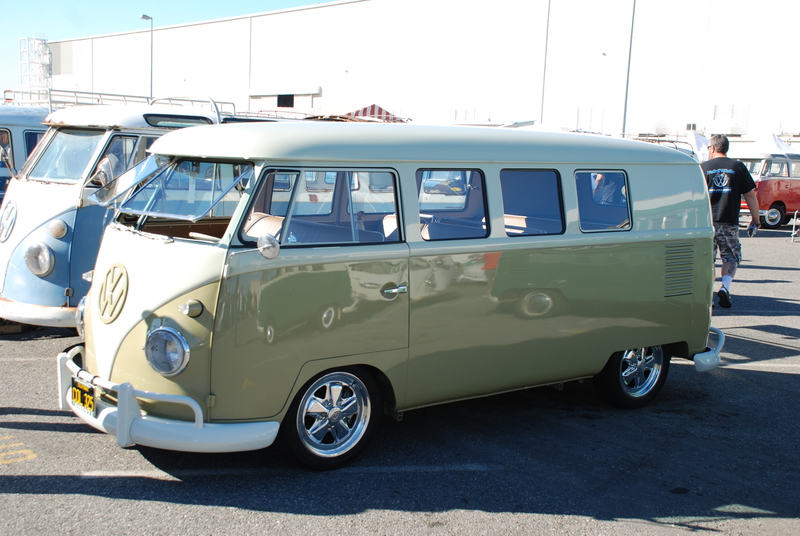 A beautifully restored two-tone Microbus, equipped with a full complement of pop out windows, and rolling on a set of chromed, Porsche 5 spoke alloy wheels. 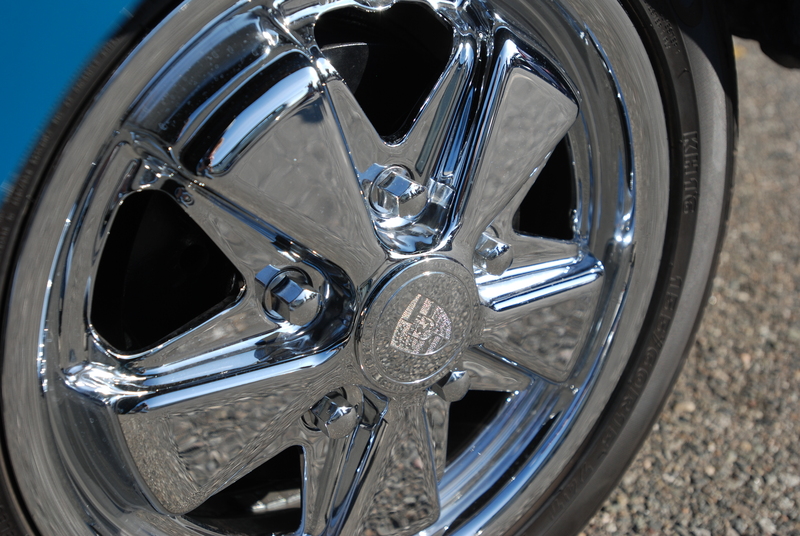 A close up of its front wheel; a 4- 1/2 X 15 inch, Porsche 5 spoke alloy as seen below. Parked along one the many perpendicular rows, was the Dove blue, late 1950s vintage Panel / Delivery van, with an interesting painted graphic on its flanks (seen below). Definitely worthy of nostalgia points, and visually period correct to the opening date of Disneyland. 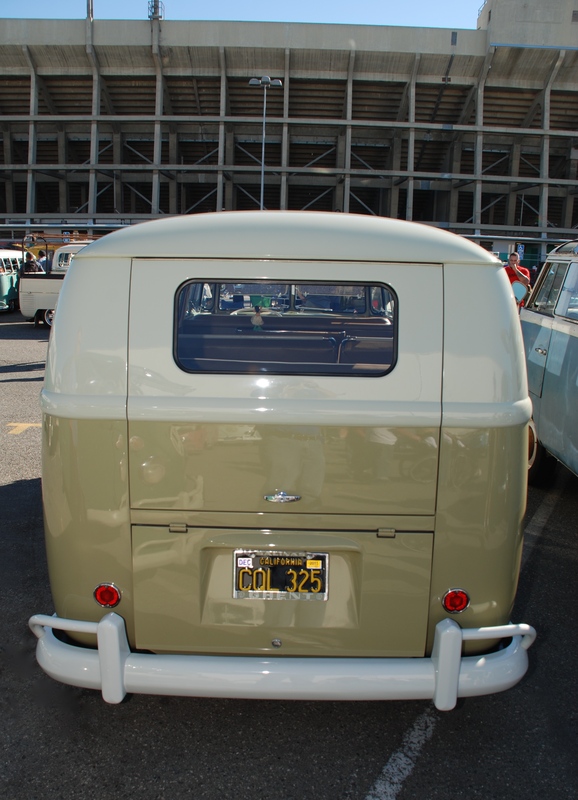 Could this panel van have been part of the vehicle pool at the Park back in the late 1950s? 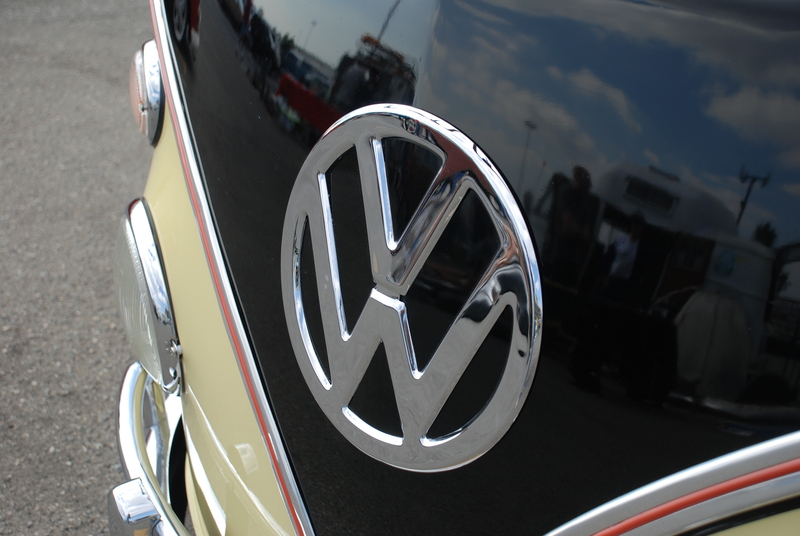 My curiosity got the better of me, so I decided to ask the owner about the origins of the bus and its graphics. 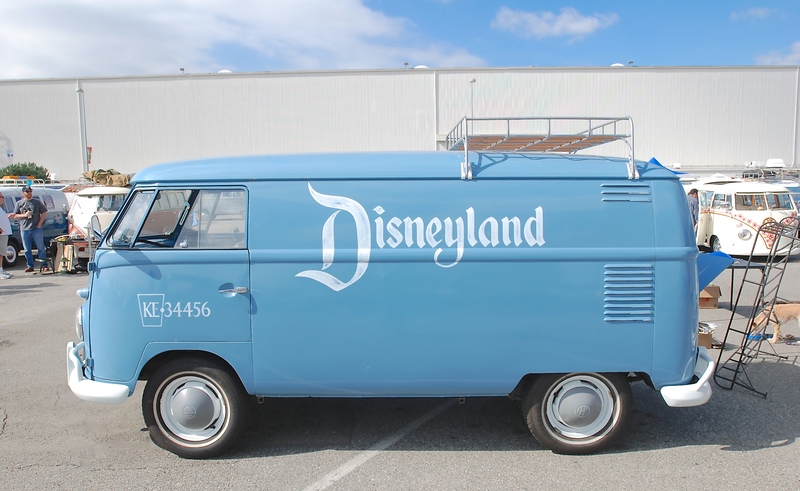 I learned that the owner is an advertising and marketing consultant to Disney, and apparently received permission to apply the Disneyland logo type onto his vintage van. 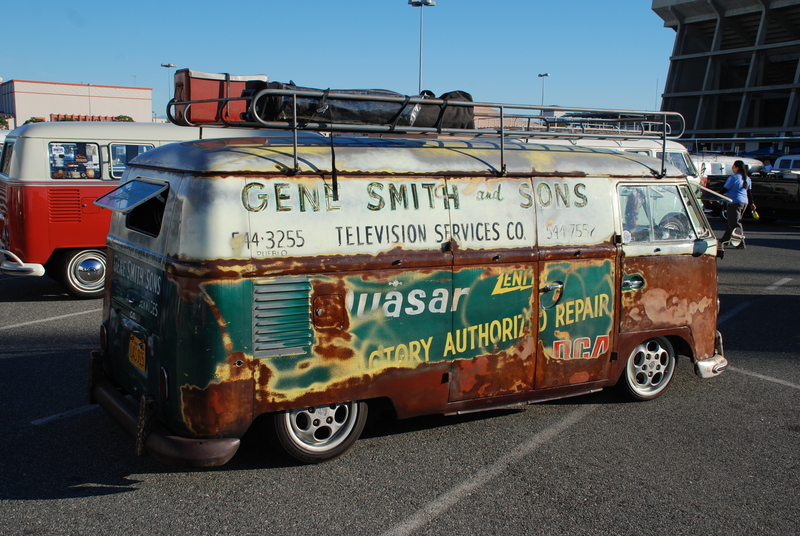 Unfortunately, he revealed that this Type 2 van was never part of the Disneyland fleet. 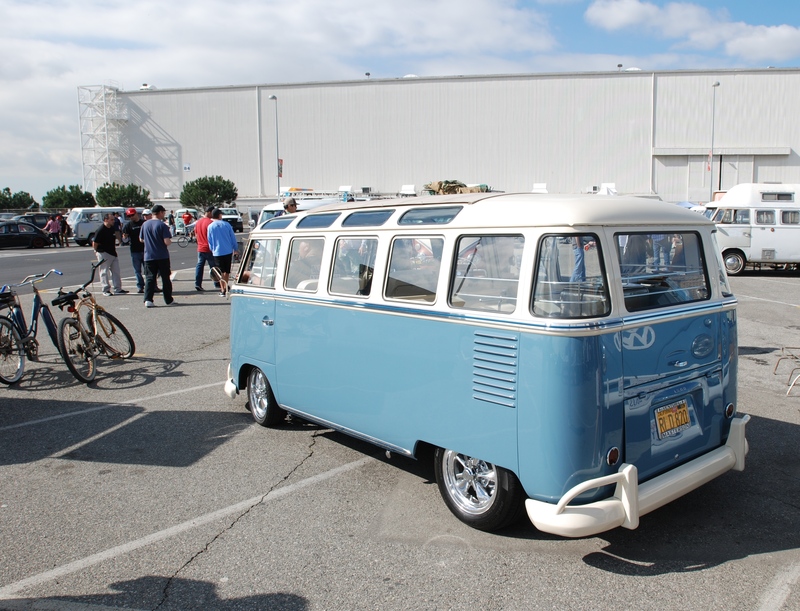 Parked immediately behind the Disneyland panel van was another vintage Dove Blue bus (below), however in this case, it was an early 1960s SO model, specifically an SO2 ( High Roof Mobile Shop) version according to my research. 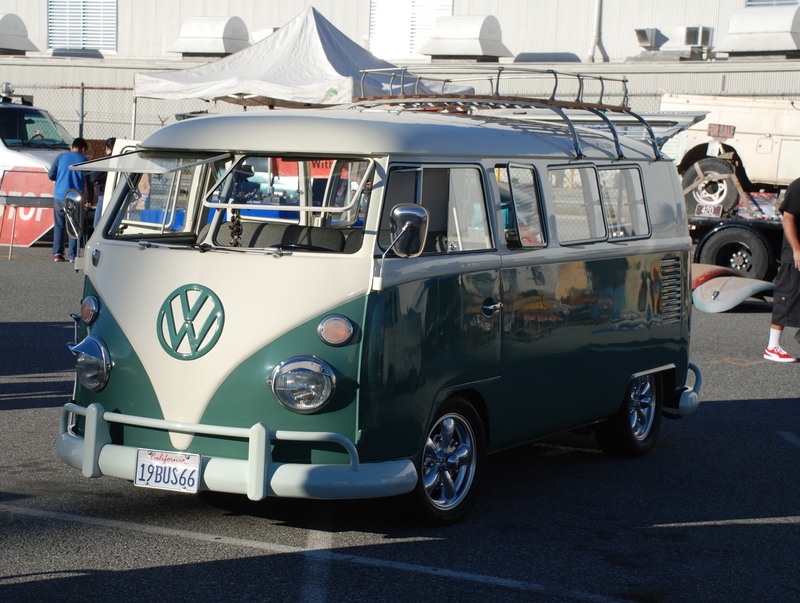 As the license plate below clearly states, yes, it’s a 1967 Deluxe Bus complete with a full set of pop-outs, safari windows up top, and a sliding roof panel, all opened to let in the early morning light and fresh air. 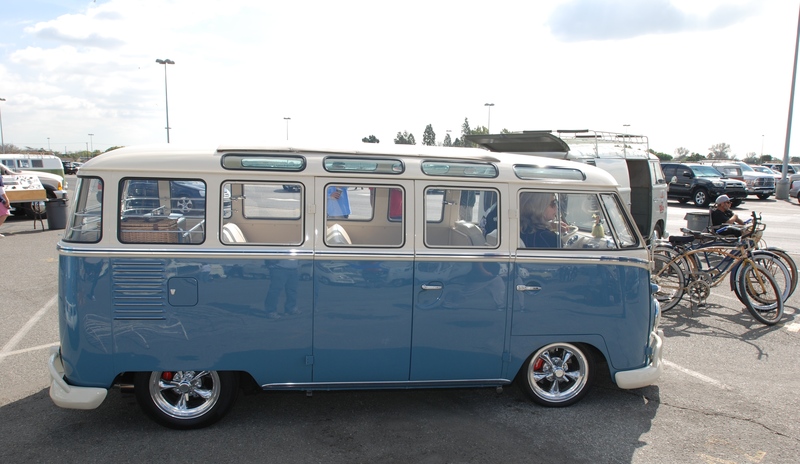 Parked further down the row was another early 1960s Deluxe Bus, this one showing its age with its heavily aged turquoise paint, and similarly equipped with pop outs and safari windows up top, all resting on a set of Porsche 5 spoke alloy wheels. 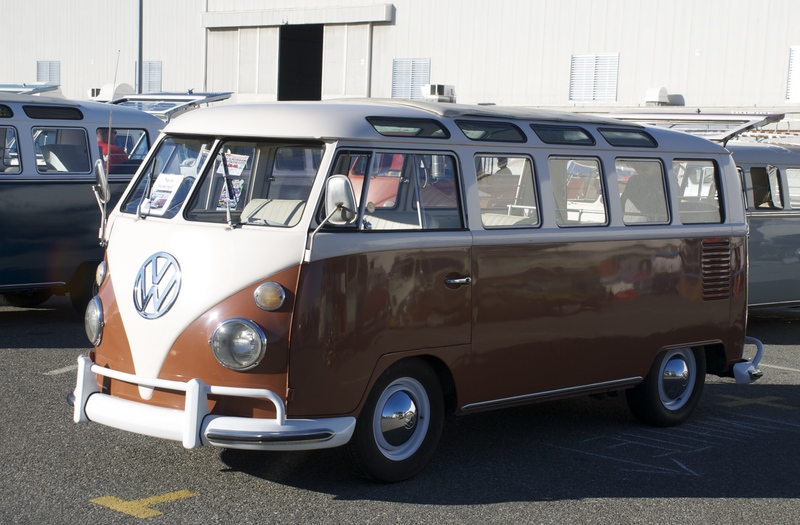 Another early 1960s vintage Microbus below, wearing multi-colored body panels, but with a highly reflective door. 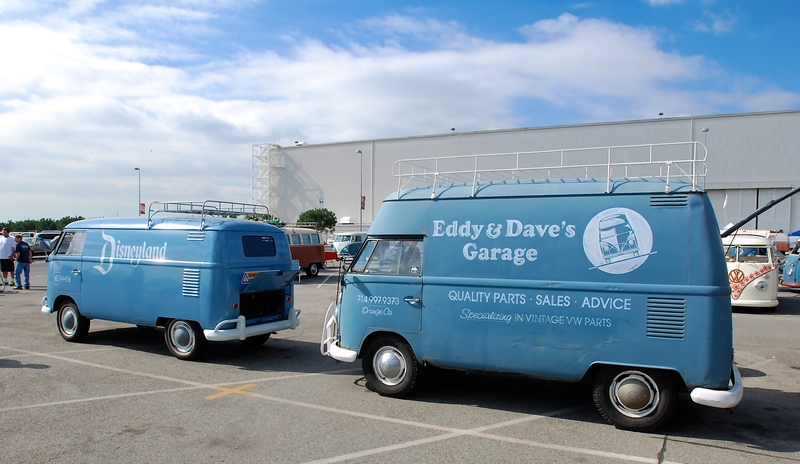 Further examples of contrasting styles present at the 2014 OCTO Winter meet; scattered groupings of Type 2s with OG patina, VS. some highly restored examples on display. 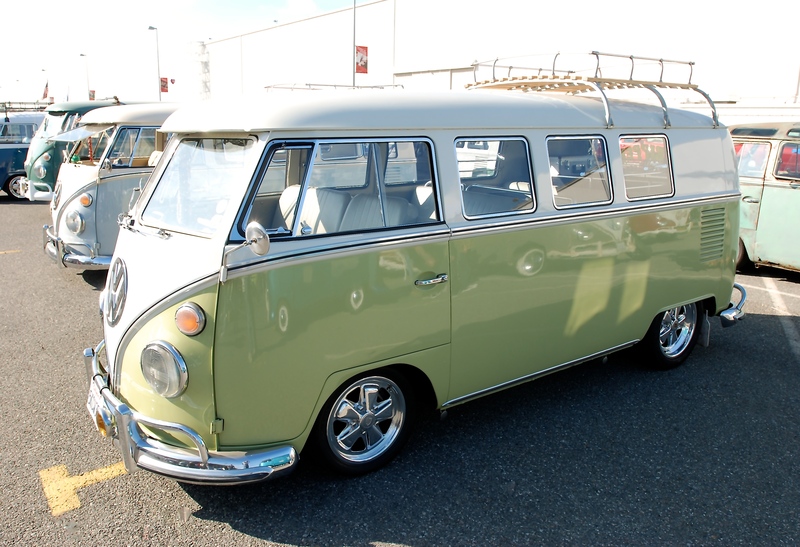 Below, one of the more highly restored models present; an early 1960s Microbus, in two-tone pale green and white, and another example running chromed Porsche 5 spoke alloy wheels. 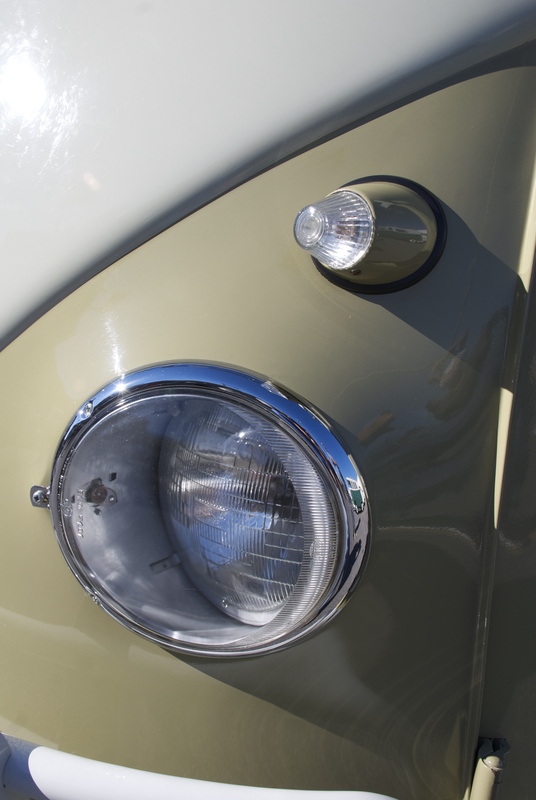 Another front end detail shot, illustrating a different style of headlight lens, close in configuration and profile to the European Bosch H4 headlights found on many Porsche 911s, but for this Type 2 application the lens is oriented horizontally. 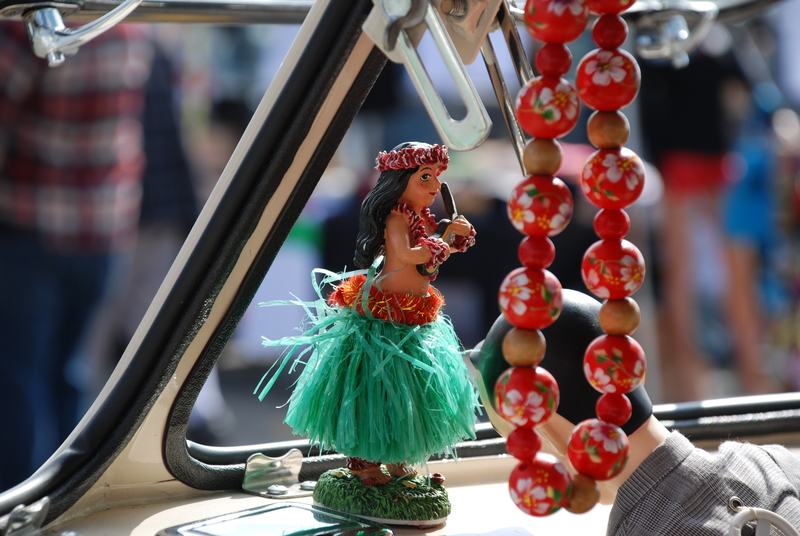 The finishing touch for many of the type 2’s in attendance; the classic, dash mounted touch of Hawaii, a.k.a. 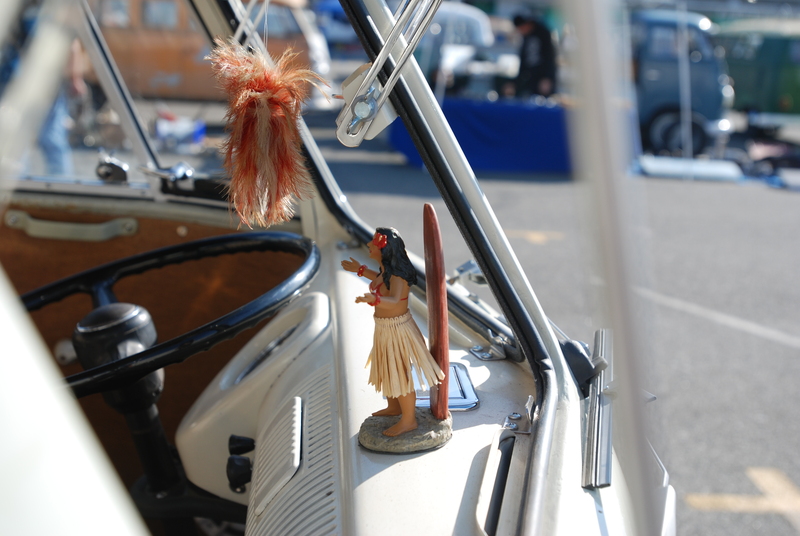 the “hula girl”. 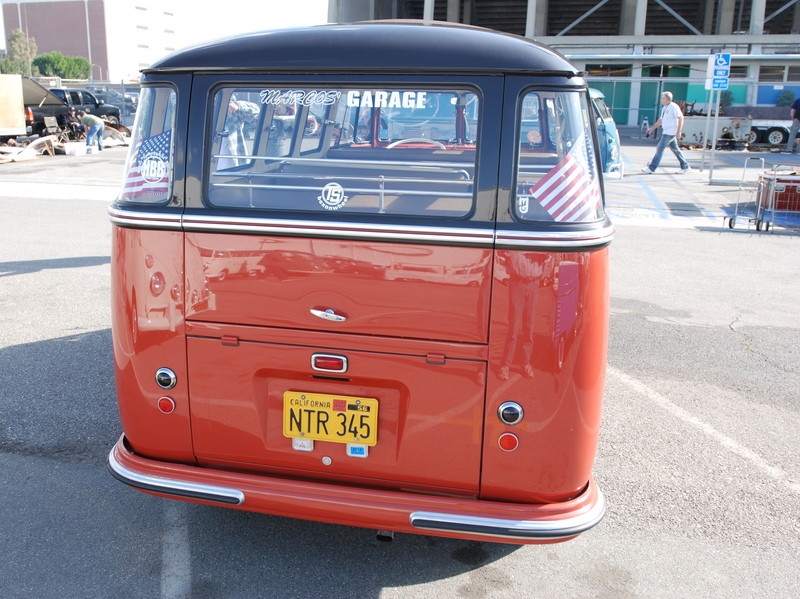 Parked along the row closest to the stadium, was one of the events elder statesman; this beautifully prepared, post 1955 Transporter, dressed in the classic Sealing Wax Red and Chestnut Brown paint combination. 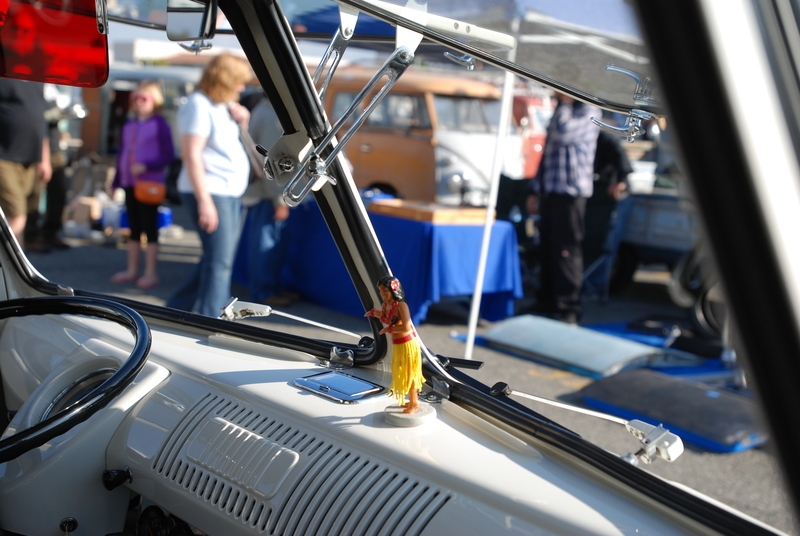 Scattered throughout the event were also a variety of vehicles offered up for sale. Below are several examples of the Type 2s on display, and looking for new homes. 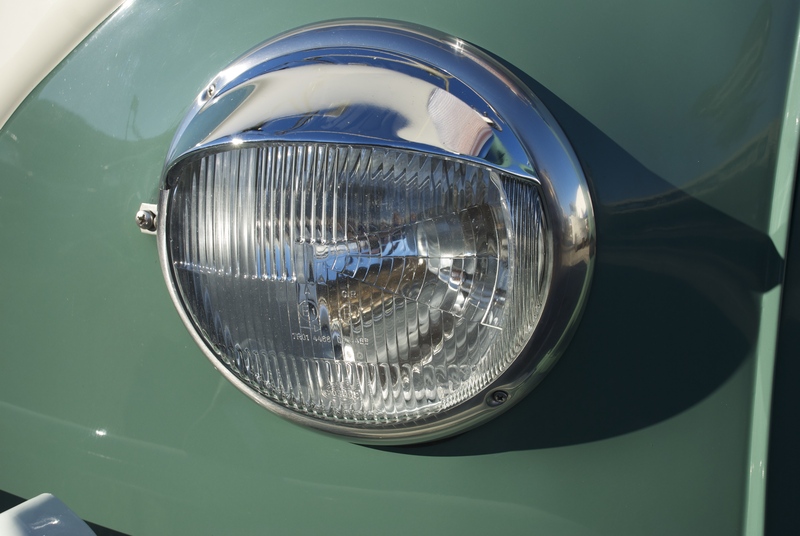 Close up view of another 1963 vintage headlight lens and turn signal combination (below). 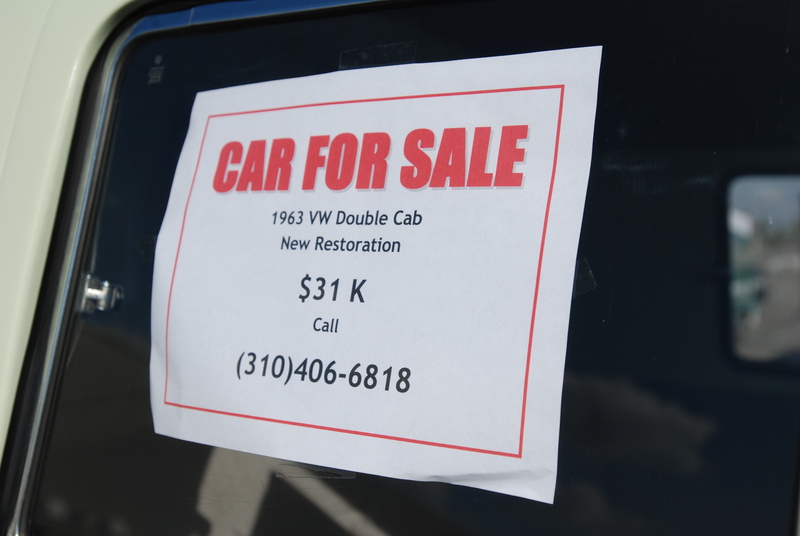 Taped to the inside of the window was a thorough description outlining the extent of the recent restoration, followed up by a second sheet noting the price, and contact information. 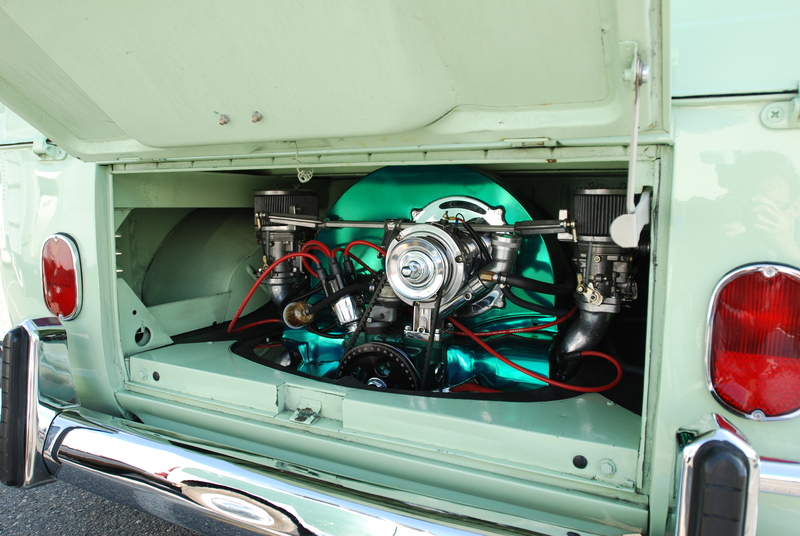 Even the engine compartment and motor received attention, including what appears to be a translucent, candy colored fan shroud treatment, providing the intense flash of color. 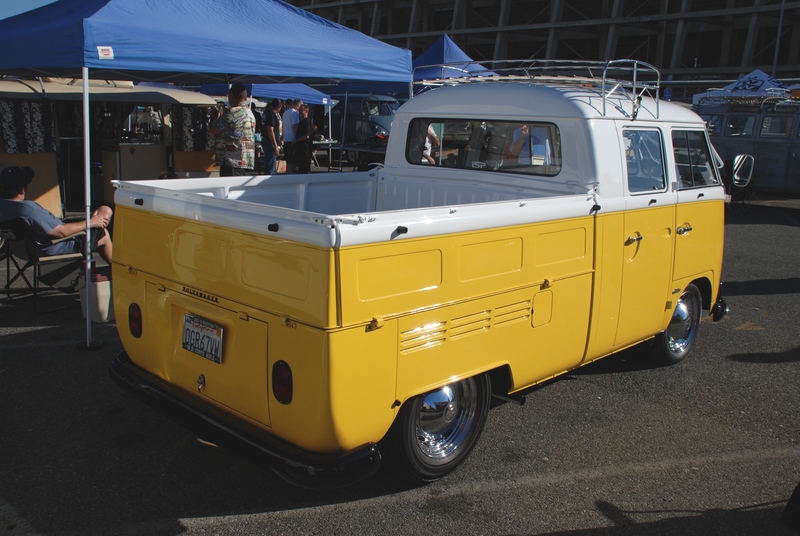 The second Type 2 being offered for sale was this Ivory colored, late 1950s vintage single cab, complete with a set of new rear bed hoops and wooden cross braces. Taking a slightly more subdued approach to restoration, staying true to its stock roots, right down to its motor. 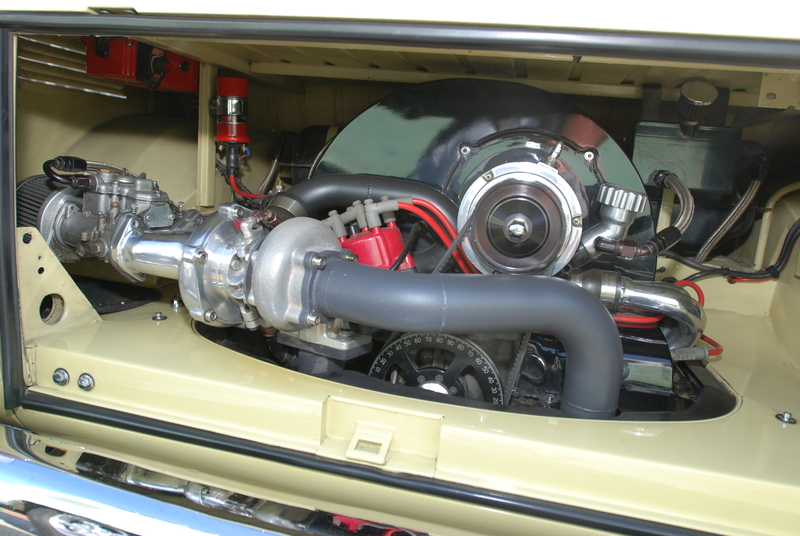 Bone stock motor ( below), complete with its left oriented, oil bath air filter, and utilized by VW from 1955 through 1963. 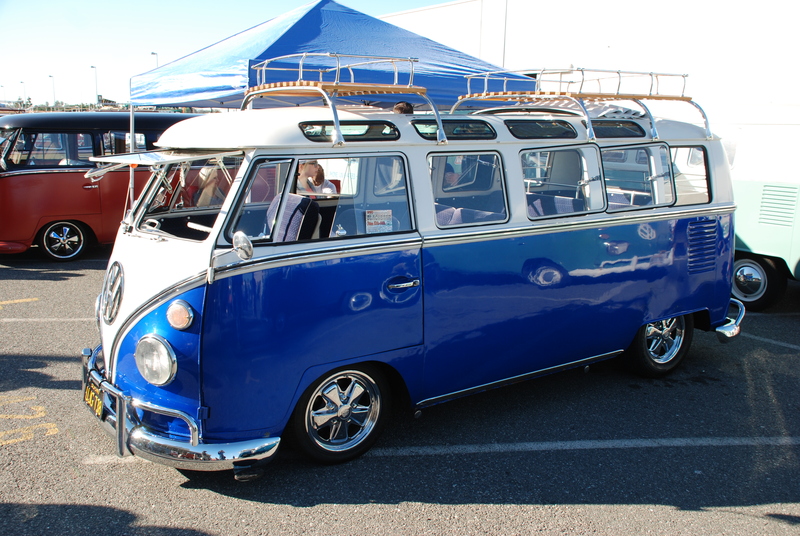 A charter member of the highly restored, late 1950s Microbus camp, dressed in what appeared to be a Dove blue and White paint scheme. 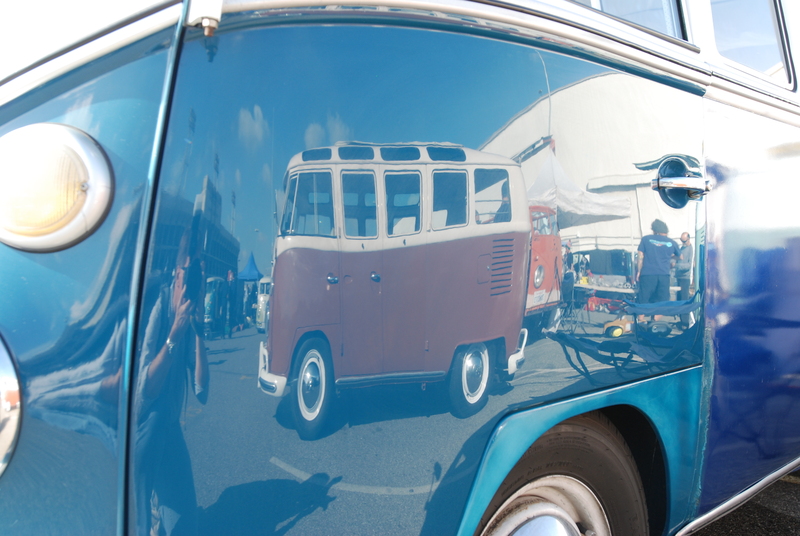 This bus had to possess one of the nicest paint jobs found in the show, as witnessed by the distortion free reflections viewed in its side body panels. 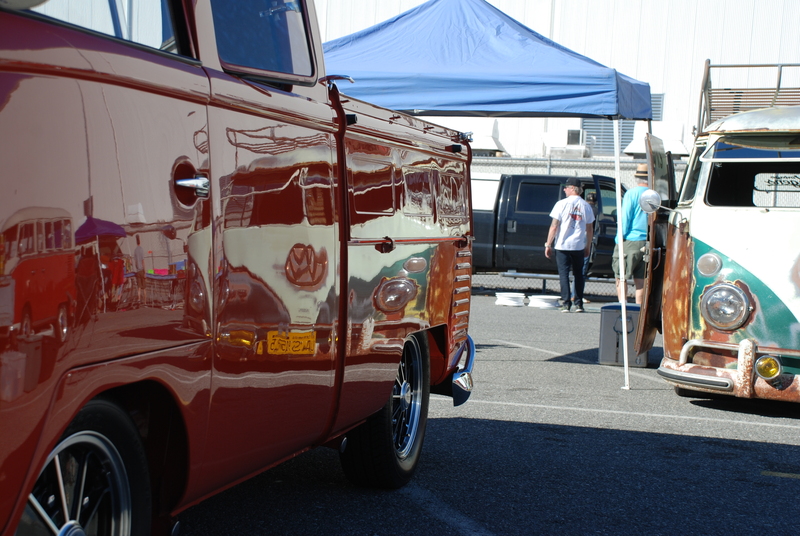 No doubt the end result of endless hours of block sanding all body panels prior to the application of its finish paint. 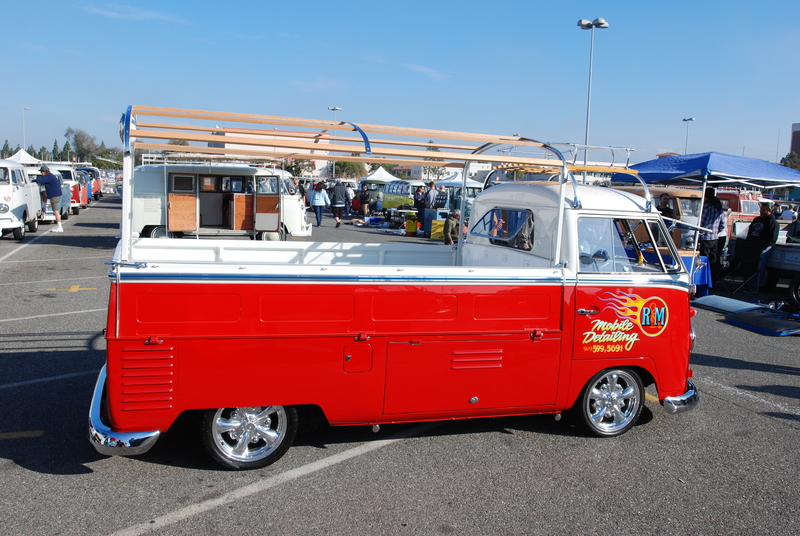 Tucked away towards the middle of the parking lot, was a beautifully restored, 1958 Type 2 Single Cab, in a glowing red and white paint scheme, complete with roof rack and rear bed hoops with wood cross bracing. 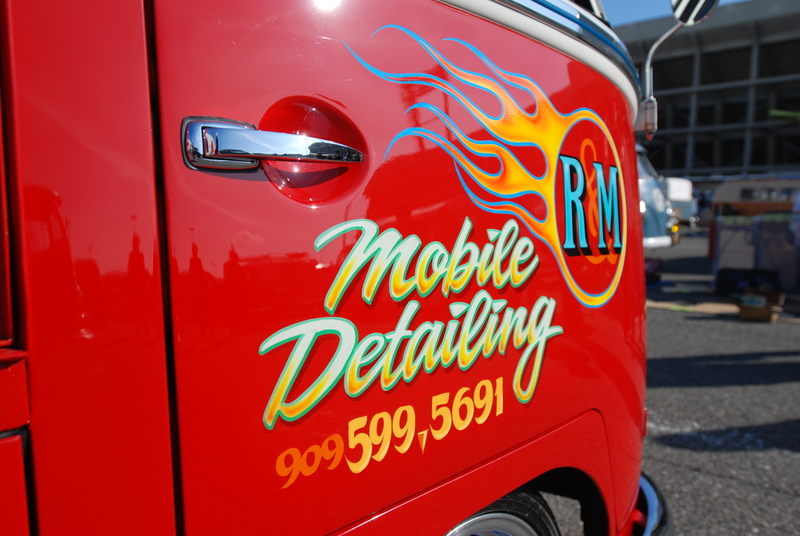 The reason this Type 2 looks so amazing is clearly noted on each door; this bus is the owners daily driver / work vehicle as he goes about his business as an automotive detailer. 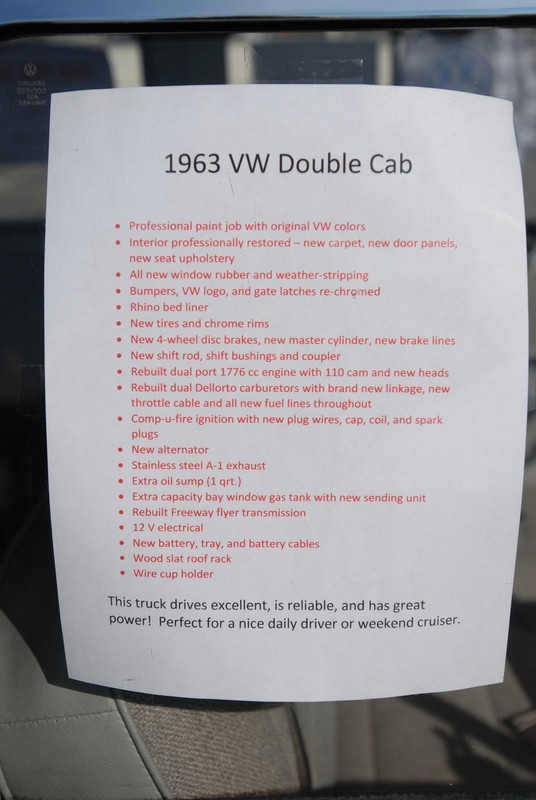 And what better way of showcasing ones business and skills, than with a pristine 1958 Single Cab as a rolling business card. 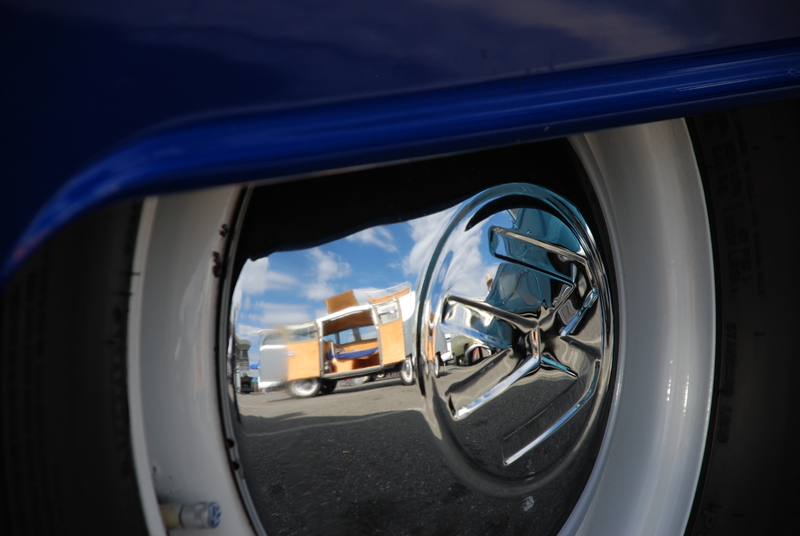 One aspect of these shows that I thoroughly enjoy, is the opportunity to talk with the owners about their vehicles, while capturing images of their rides. 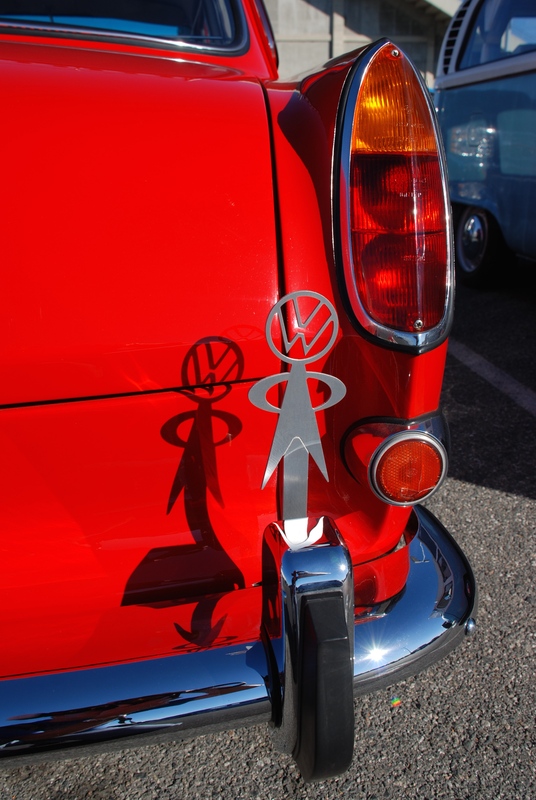 In this case, I struck up a conversation with the owner (Ryan), and learned that his Single Cab had been a Christmas present from his wife nine years ago (how cool is his wife!). 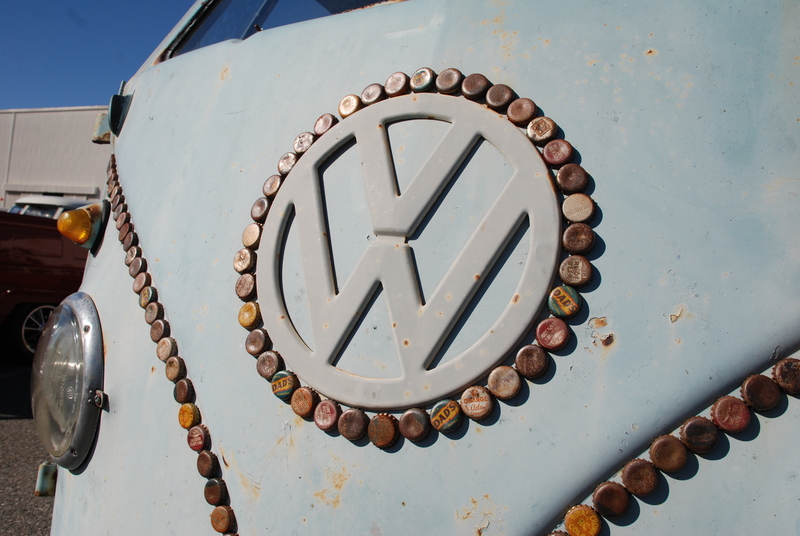 It’s apparent that all of his work over the years have been a true labor of love for the owner. 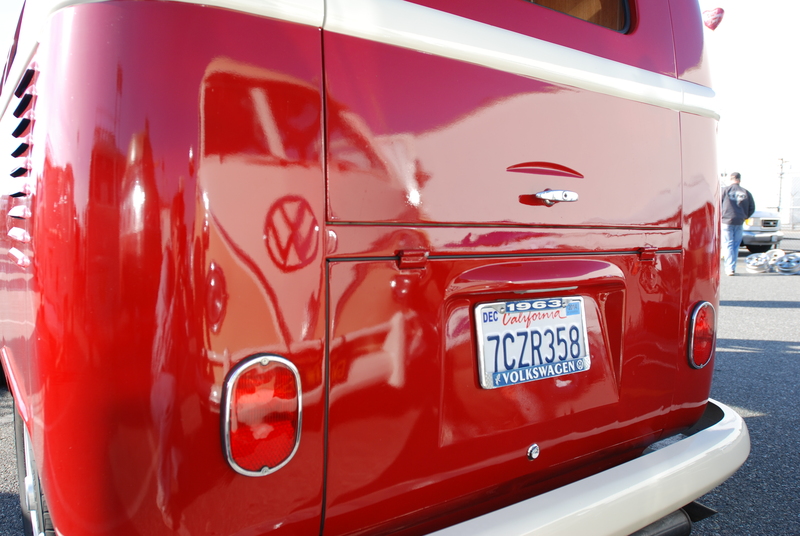 And given the number of people stopping by to talk with him about his Single Cab, his hard work has not gone unnoticed. 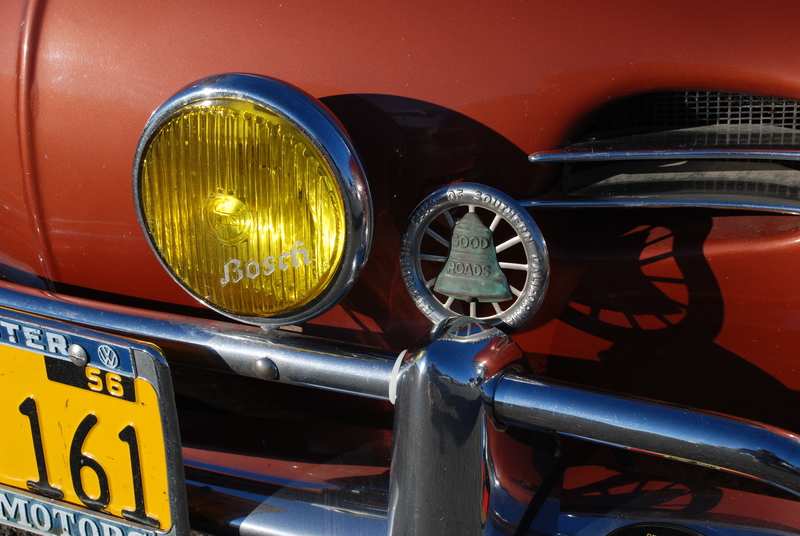 The period correct, 1958 shallow profiled glass headlight lens and its companion bullet indicator. 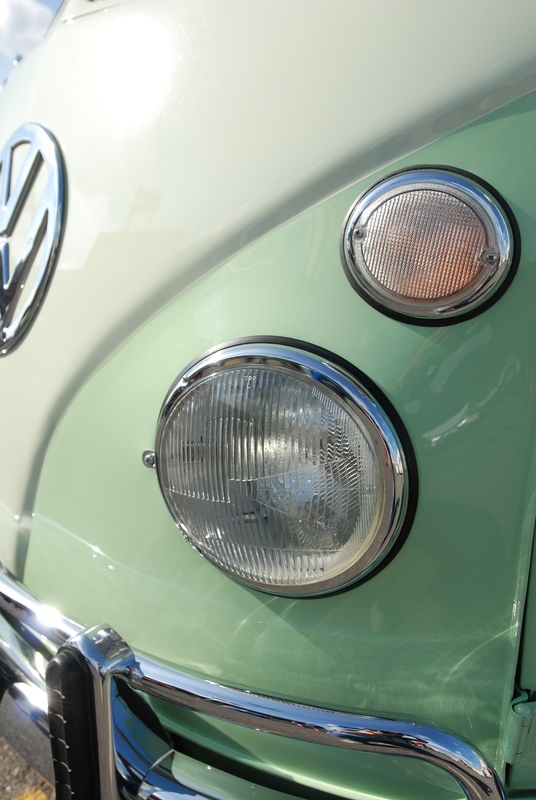 I also found it interesting to note the different ribbing details, visible on the glass headlight lens below. 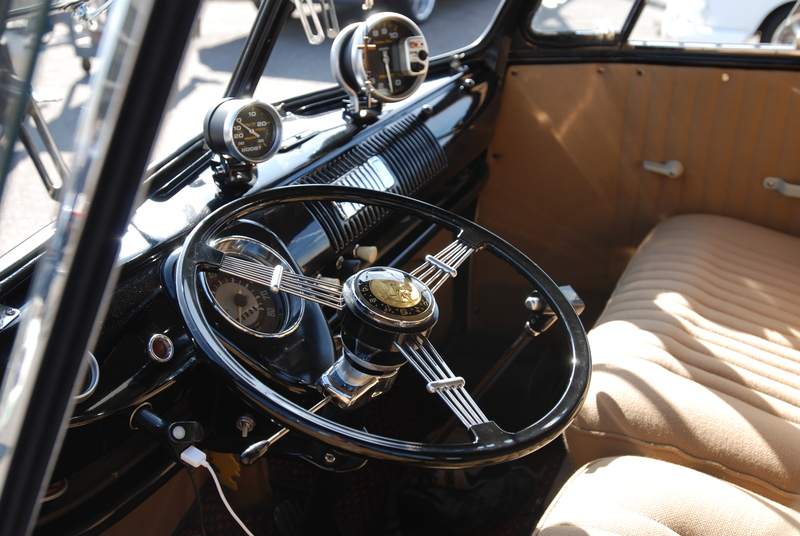 The spotless interior, complete with a subtle detail; the inclusion of a Porsche crest as the steering wheel horn button. 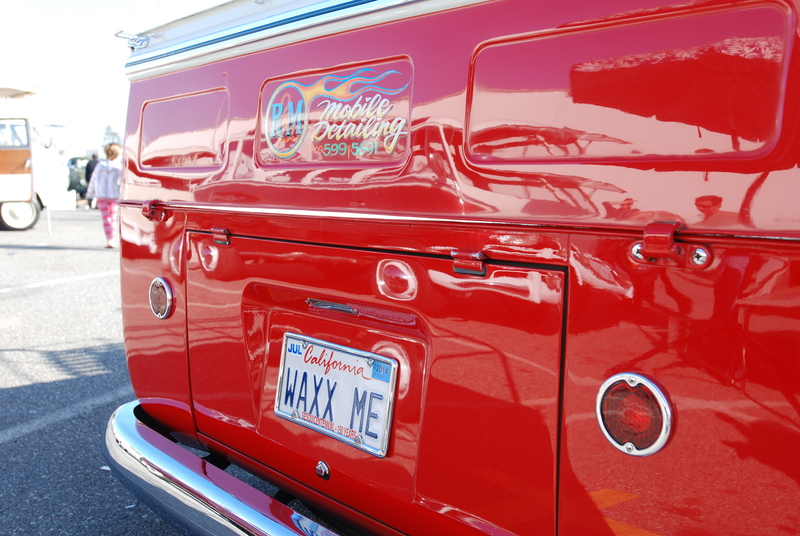 Ryan’s license plate stating the obvious; given the highly reflective nature of this paint finish, it’s clear to see the owner knows how to detail a vehicle. 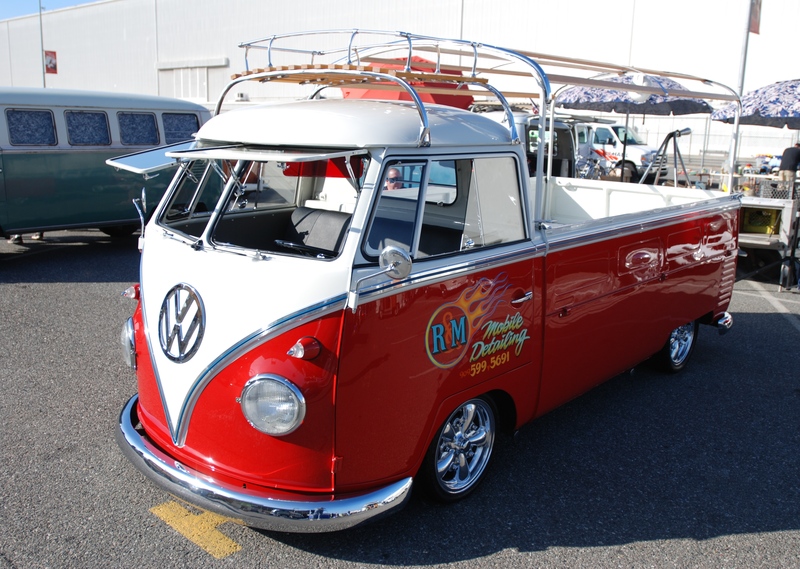 I wonder how many time this Single Cab has been waxed ? 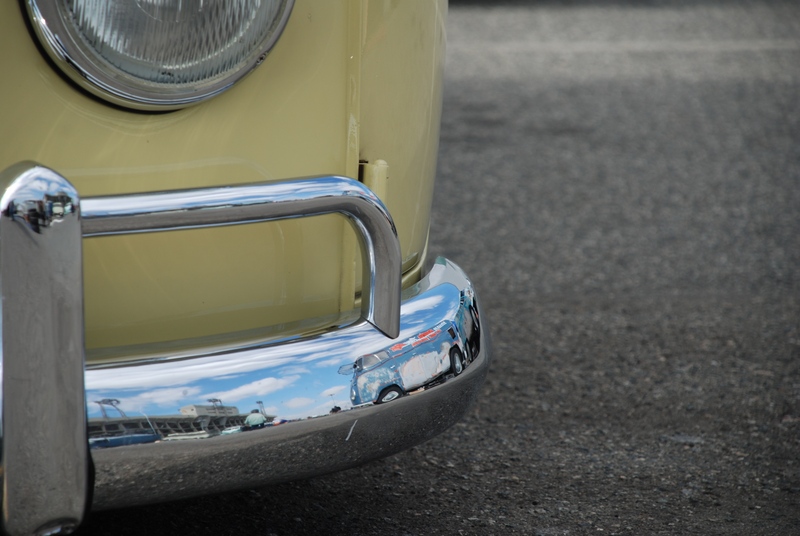 Last up is the third of my selected standout Type 2s from the show, as seen below. 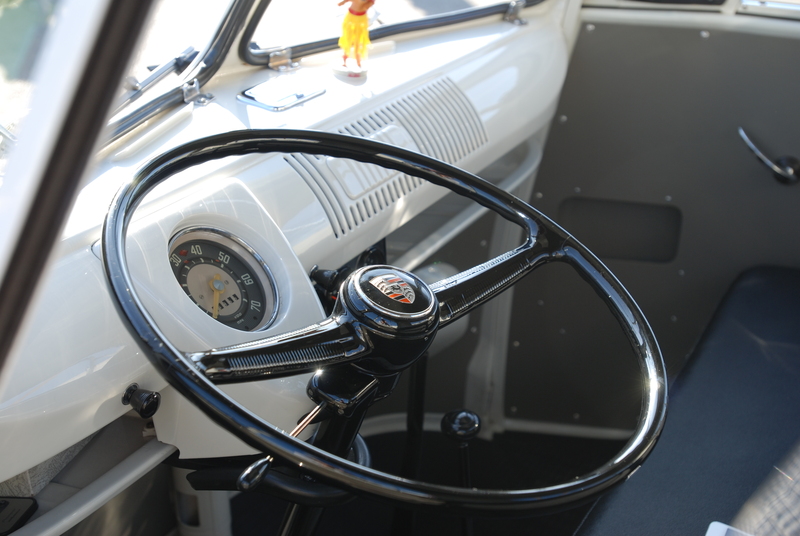 Even the interior was as clean and detailed as the outside of this early 1960s vintage bus. Located out back was one very unexpected sight. 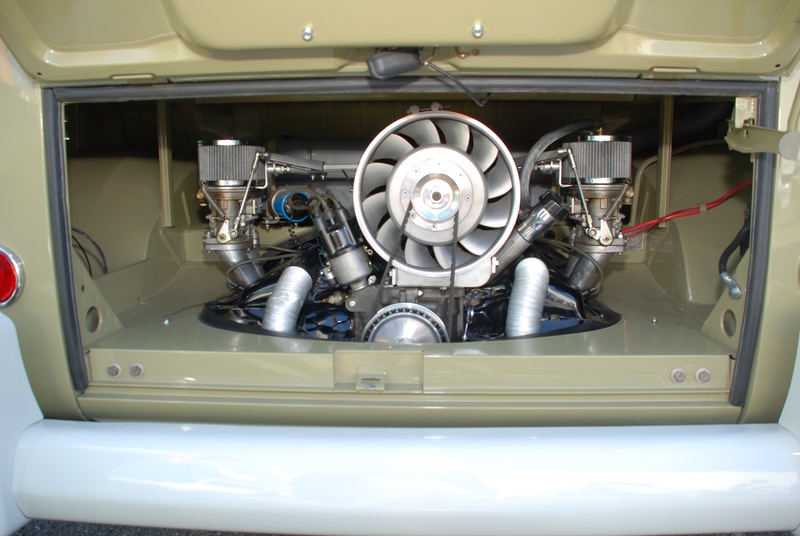 Tucked into the engine bay, was a very impressive turbocharged motor, which according to the owner, really make this bus into a freeway flyer, and a lot of fun to drive. 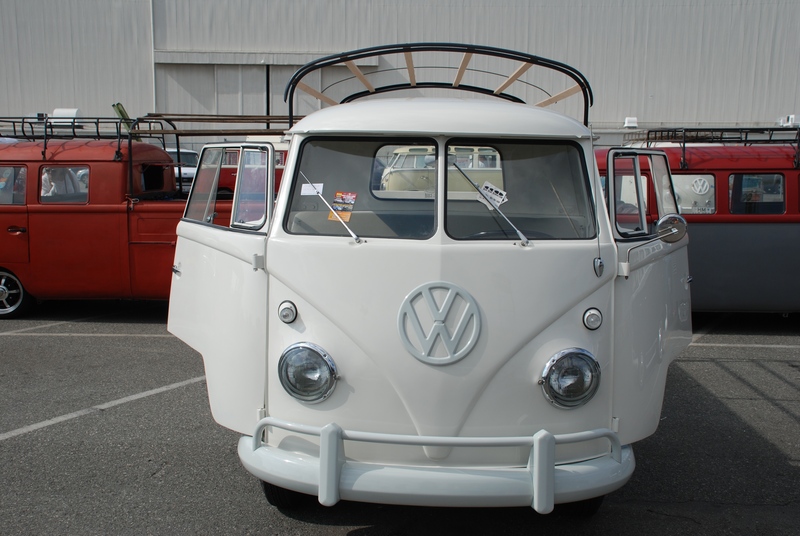 The smiling, happy face of a type 2 bus; enhanced by its safari pop – out front windows, chromed front bumper, and lowered suspension.